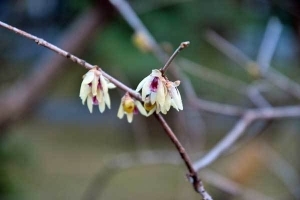 背景のピンクは寒緋桜です。The pink in the background is Taiwan cherry. 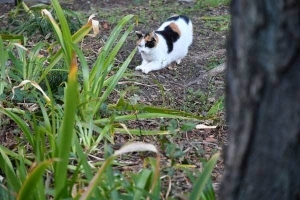 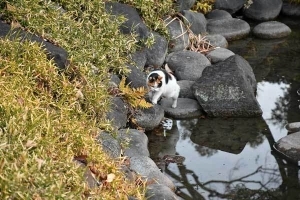 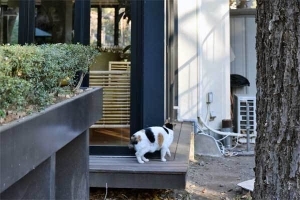 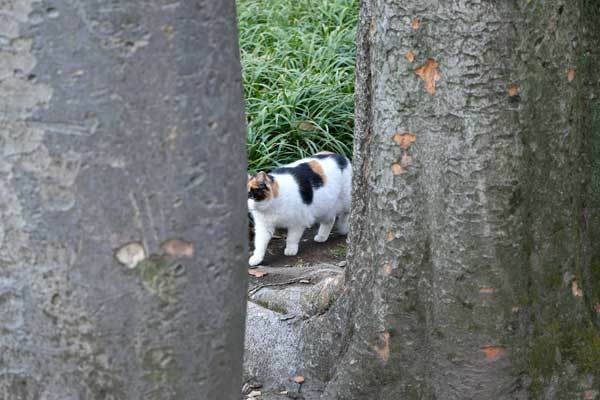 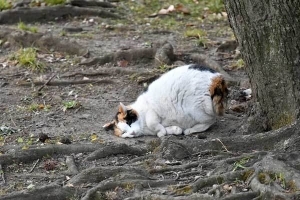 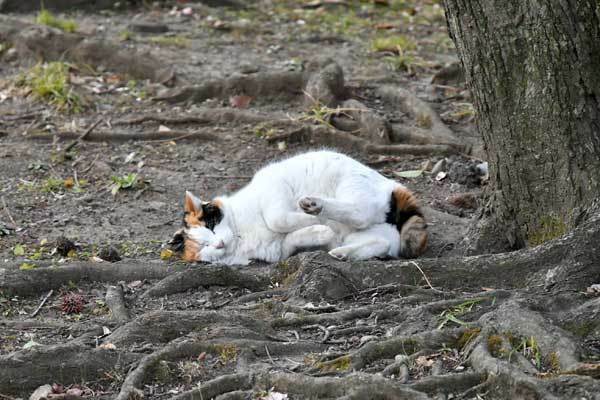 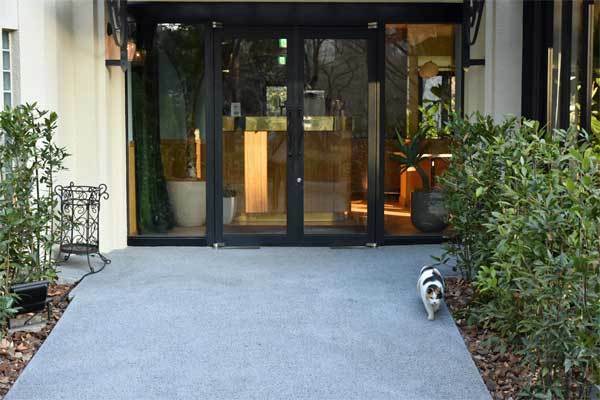 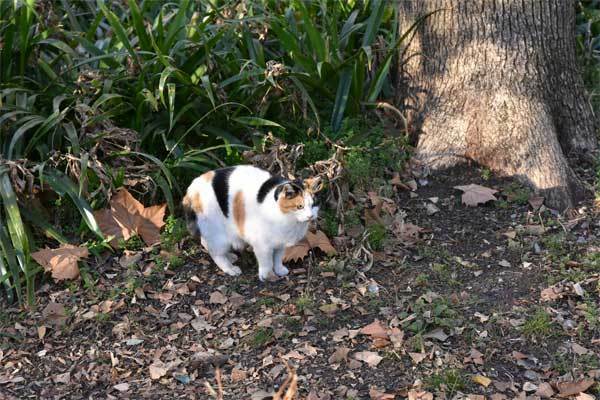 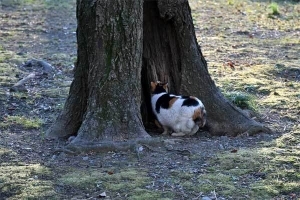 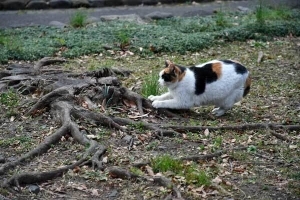 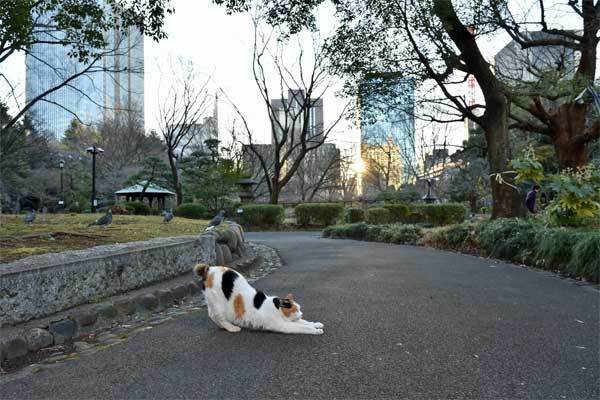 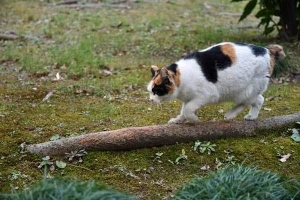 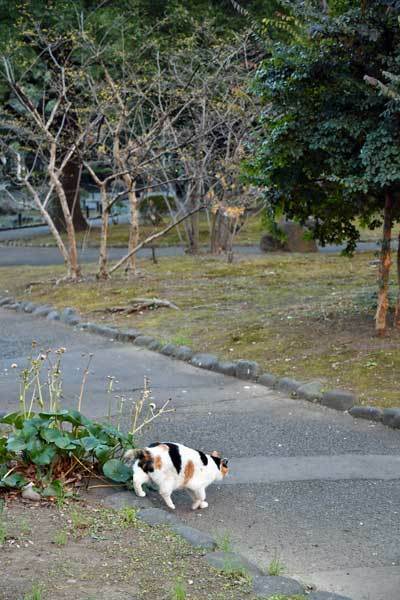 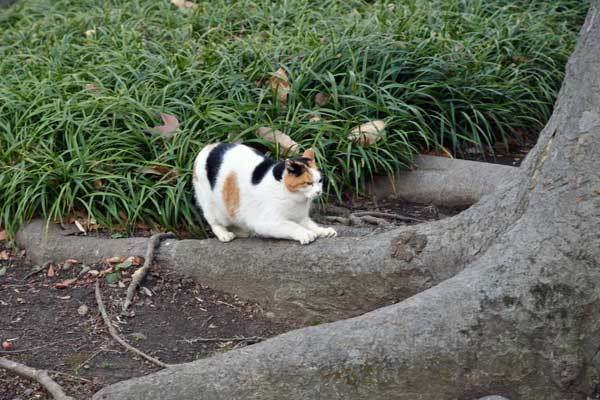 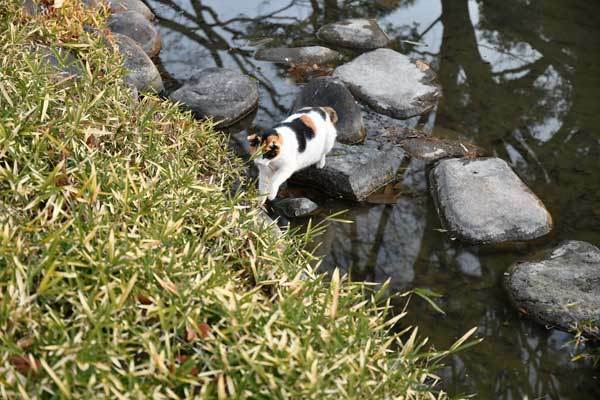 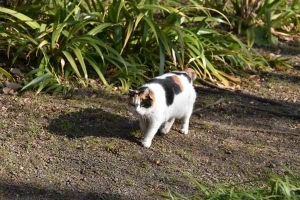 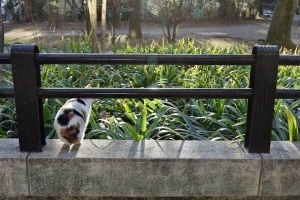 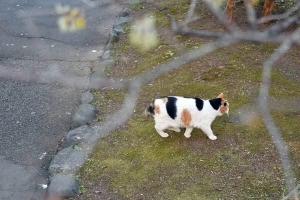 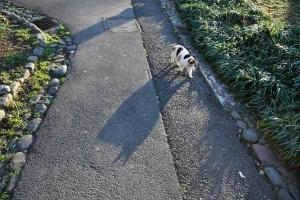 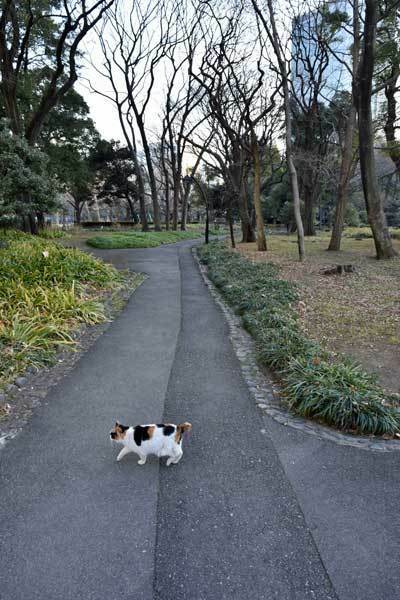 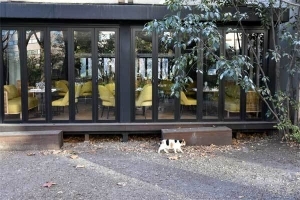 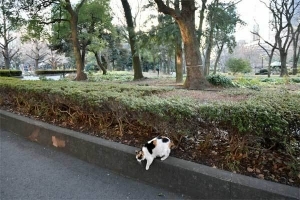 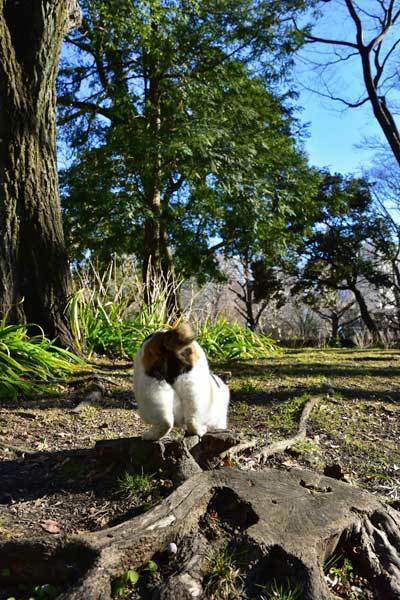 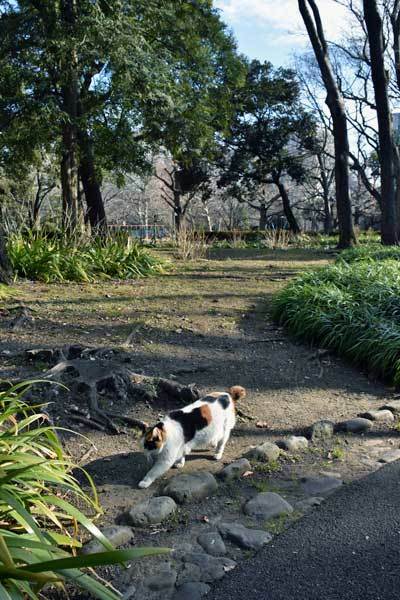 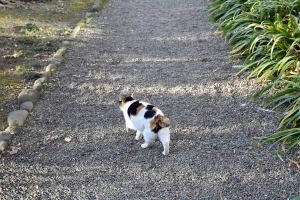 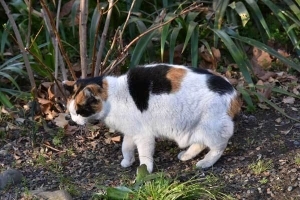 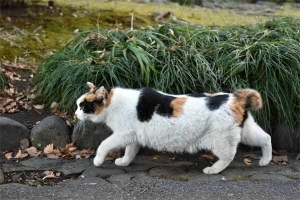 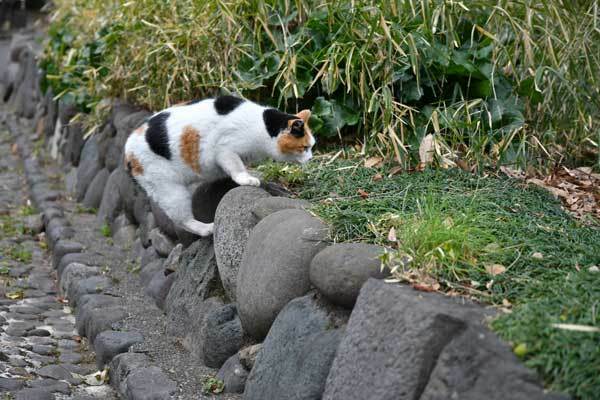 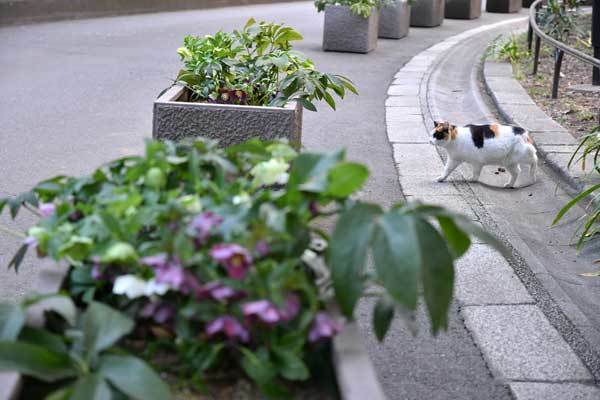 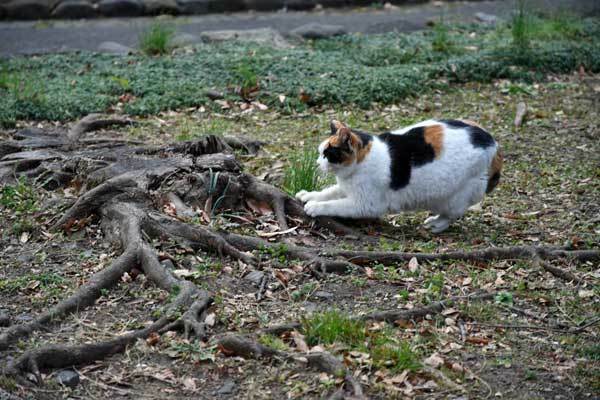 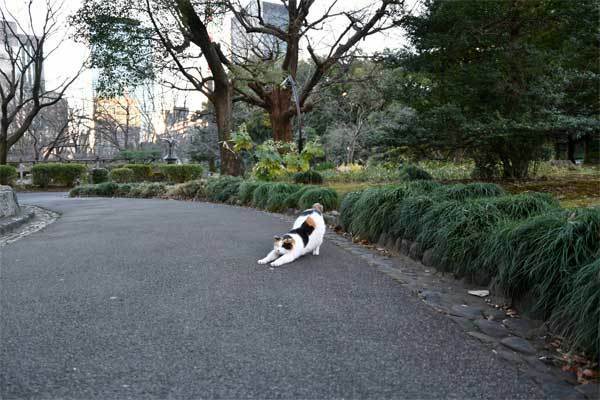 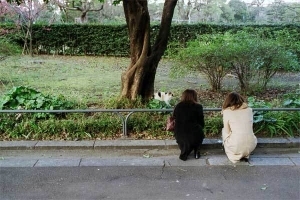 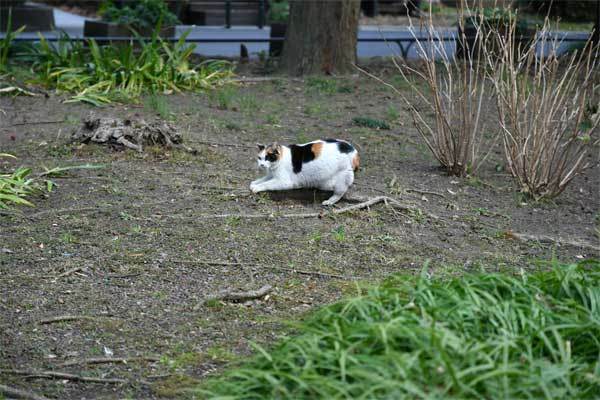 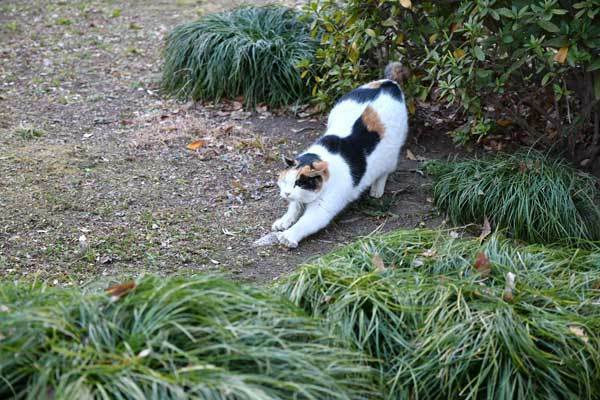 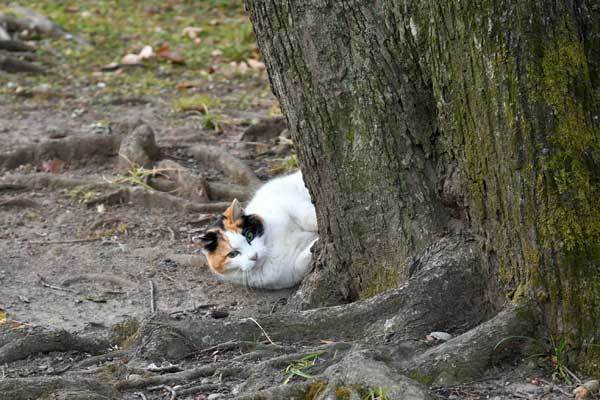 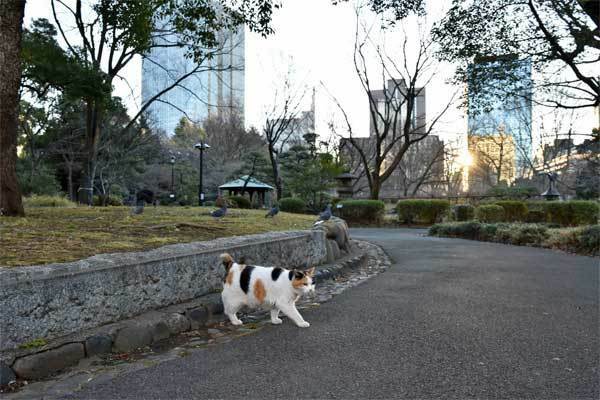 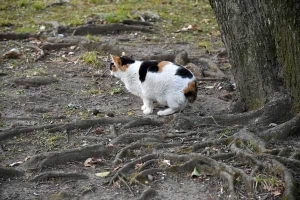 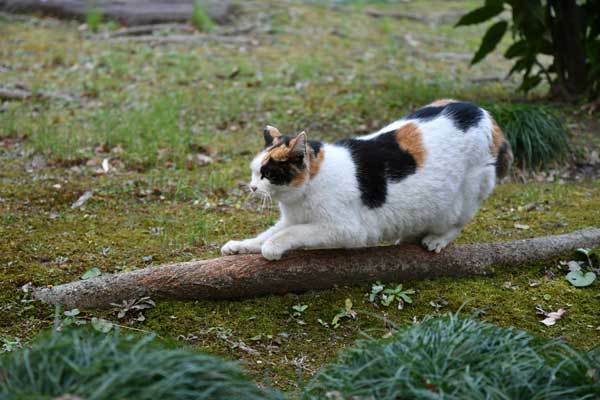 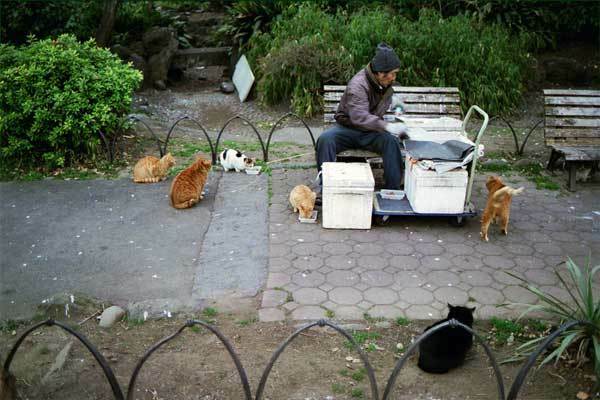 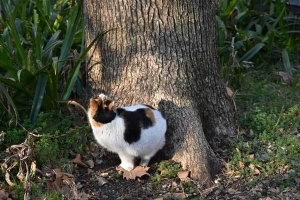 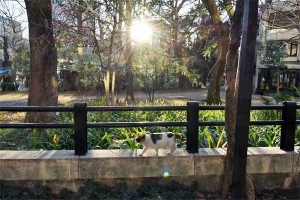 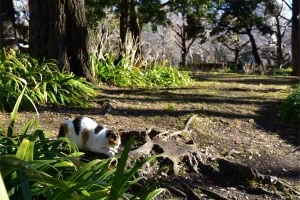 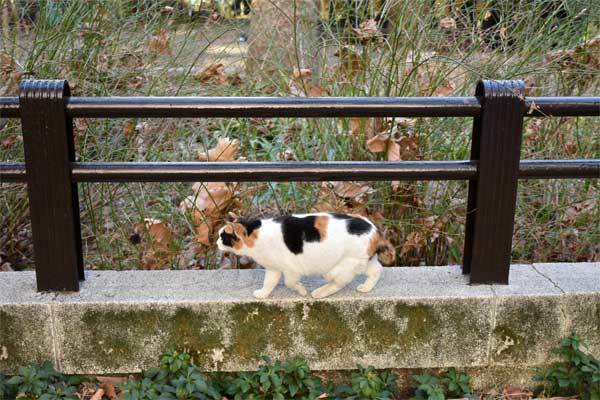 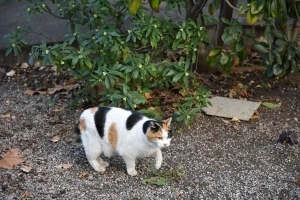 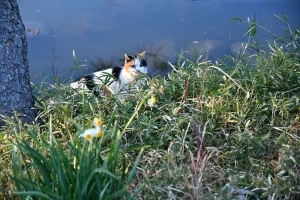 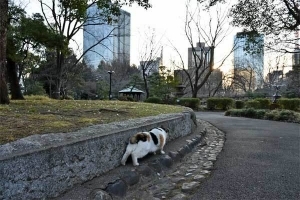 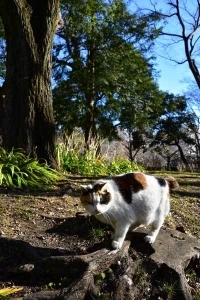 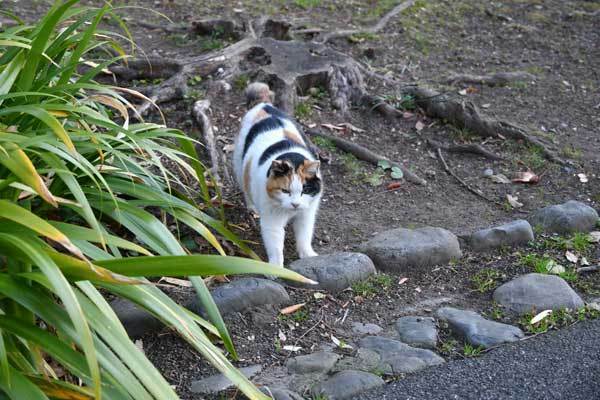 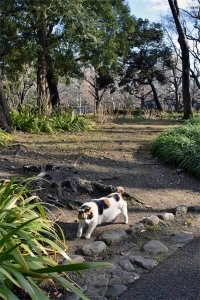 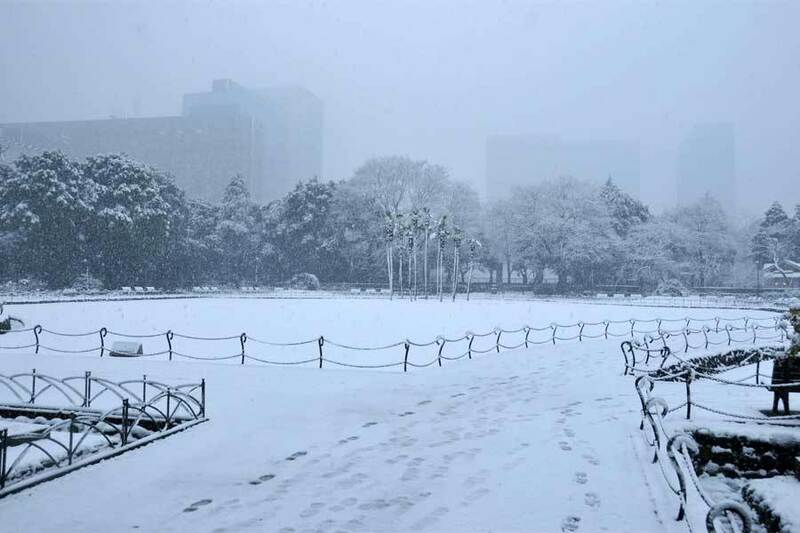 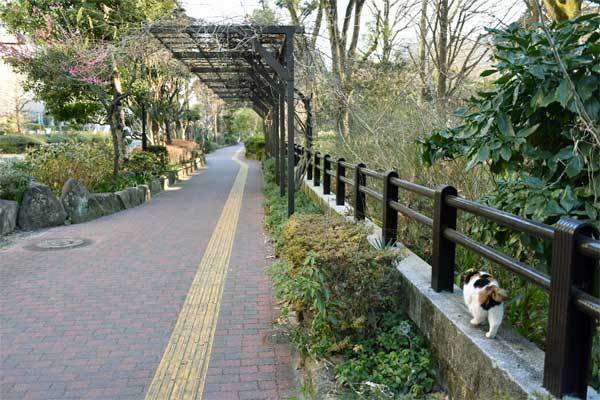 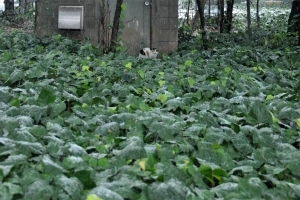 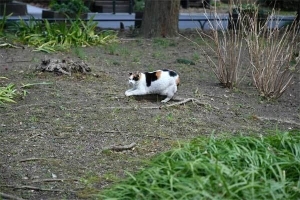 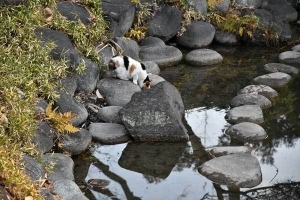 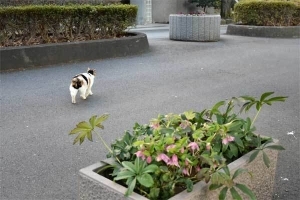 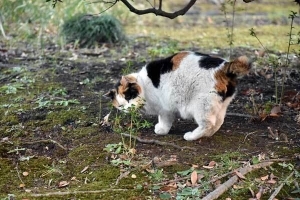 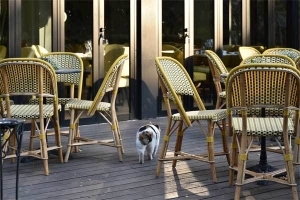 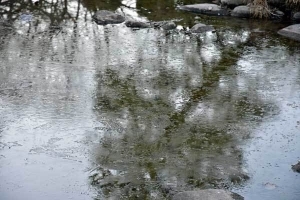 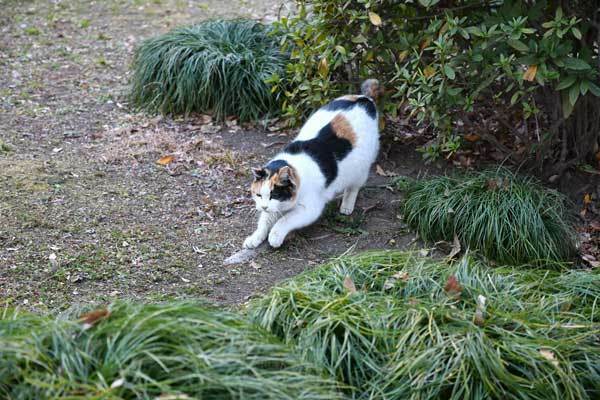 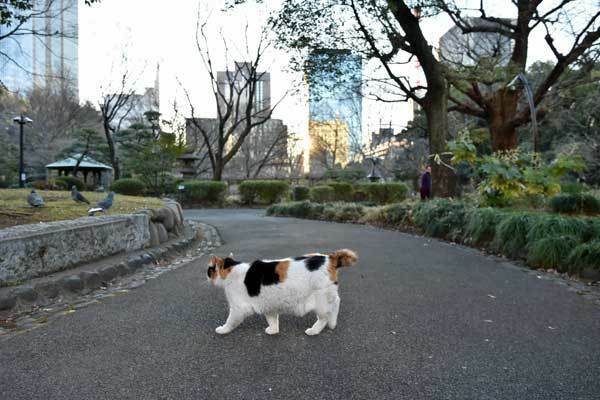 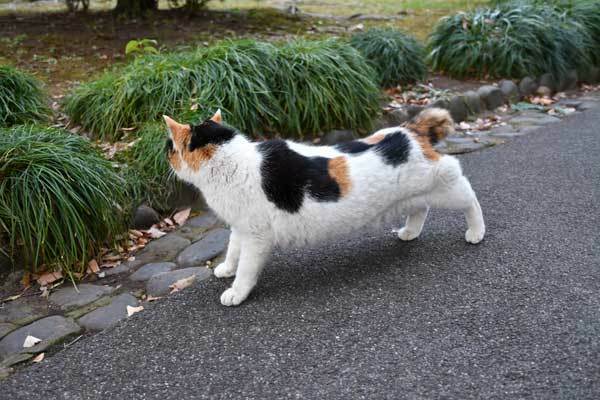 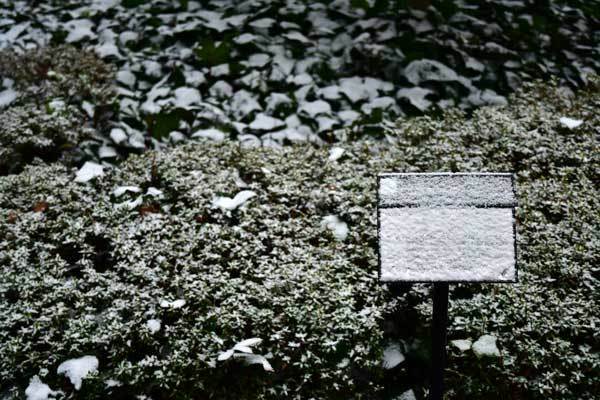 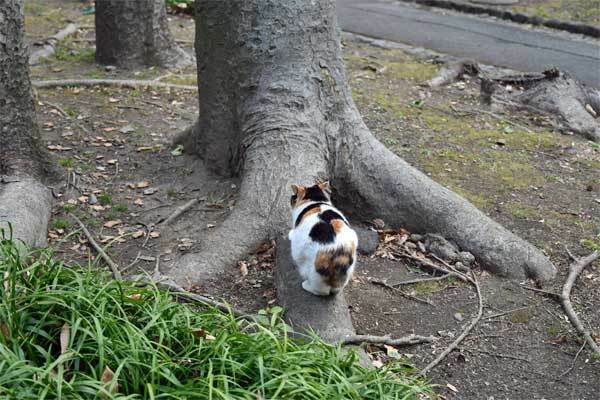 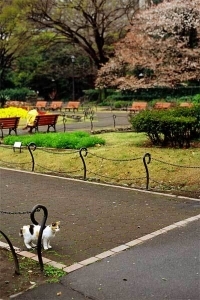 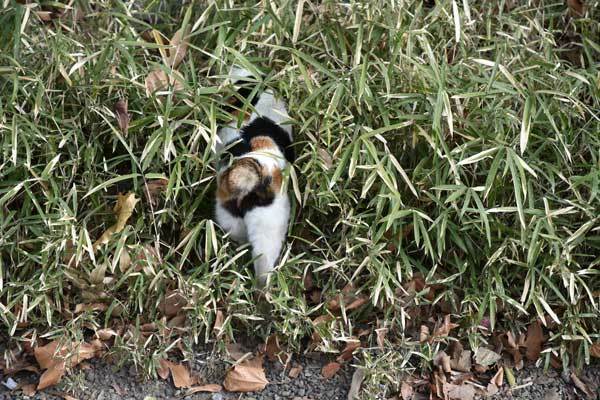 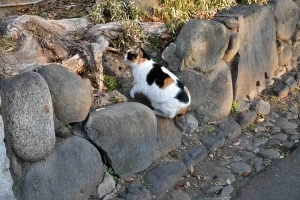 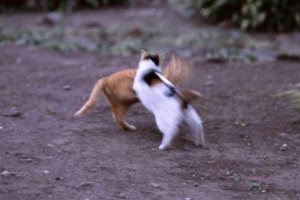 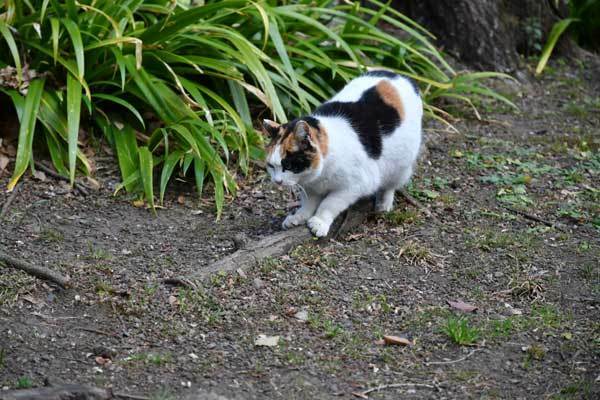 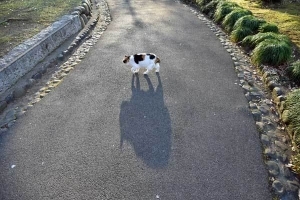 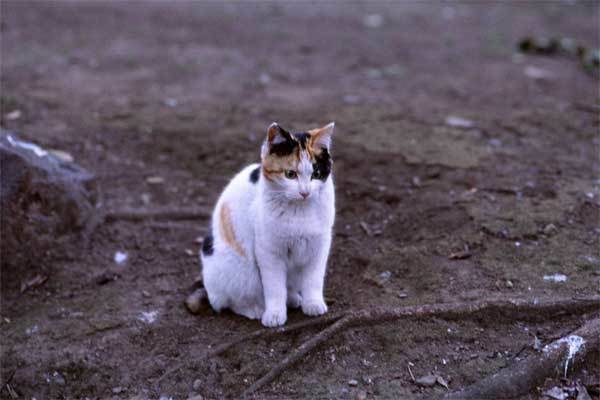 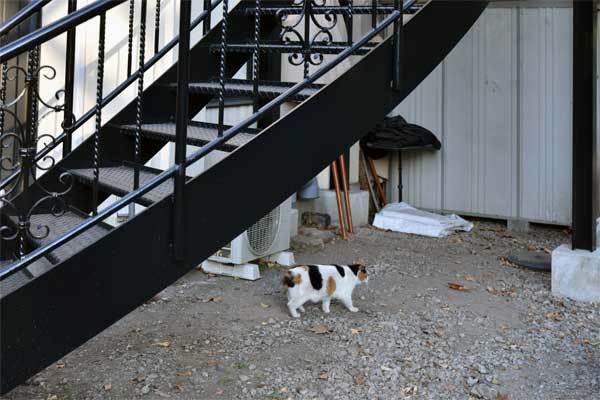 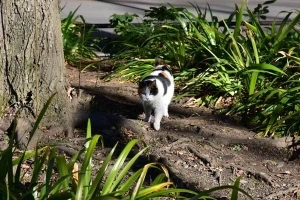 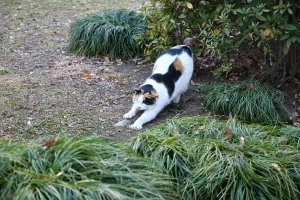 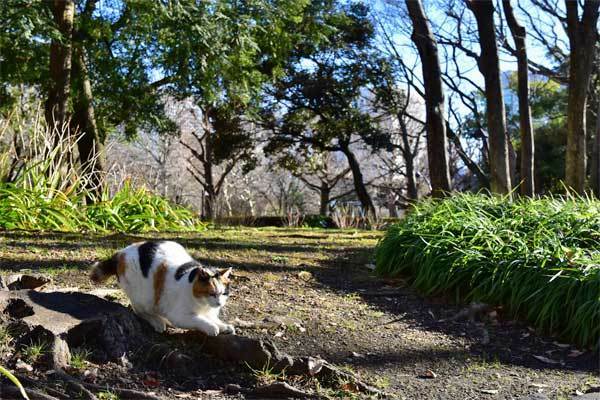 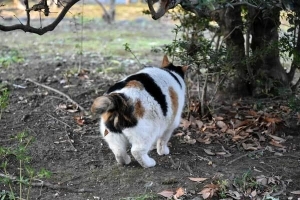 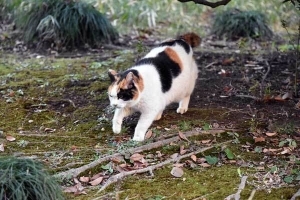 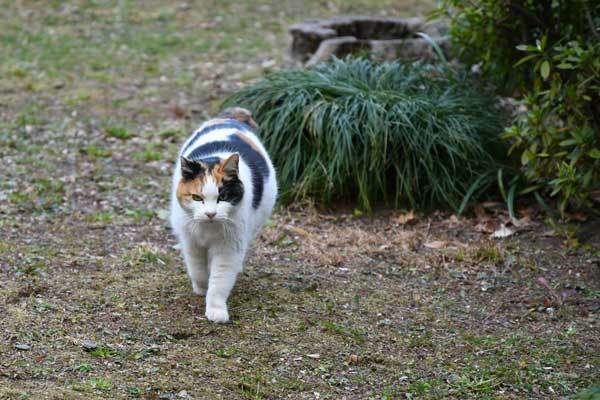 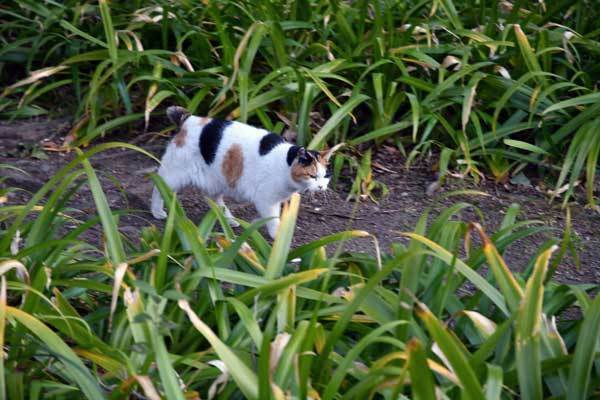 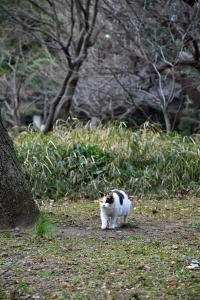 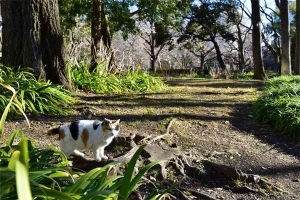 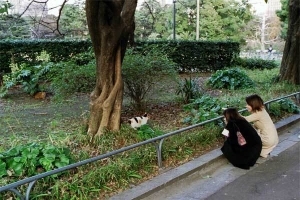 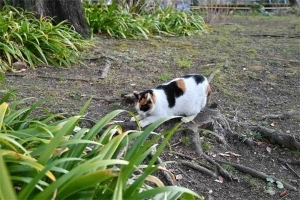 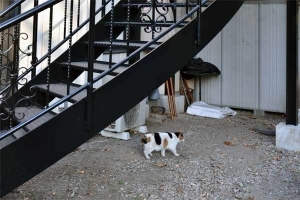 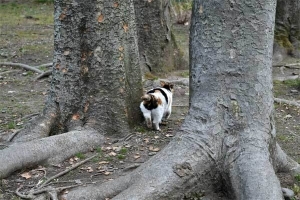 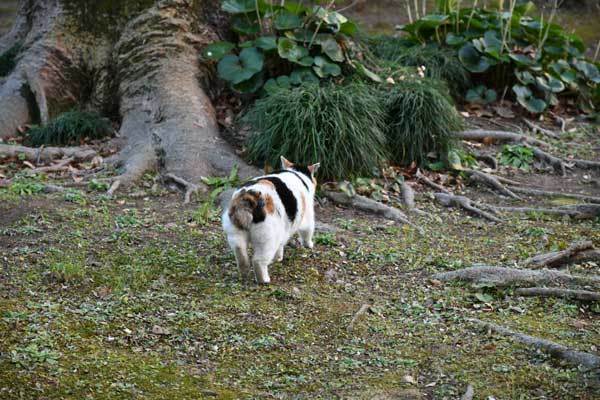 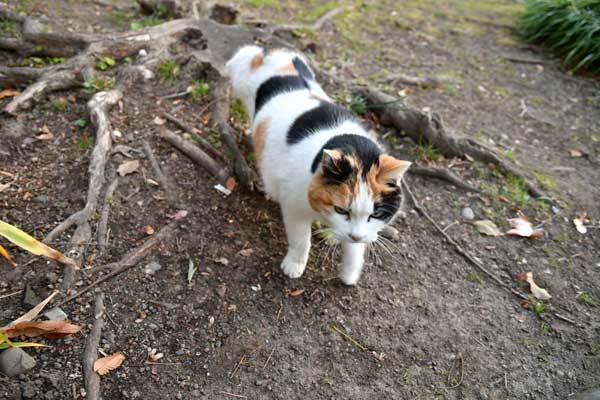 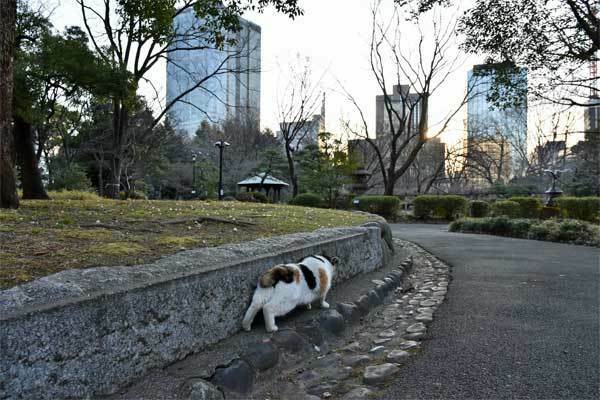 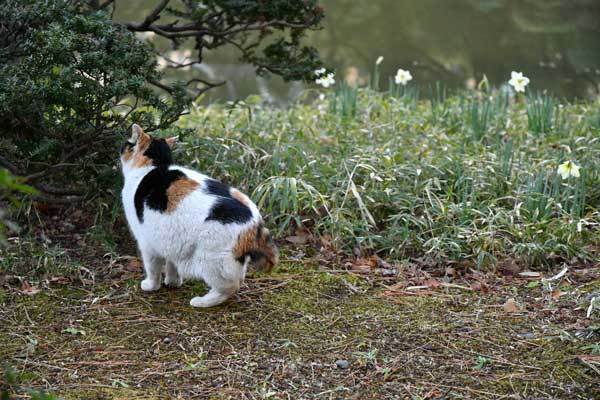 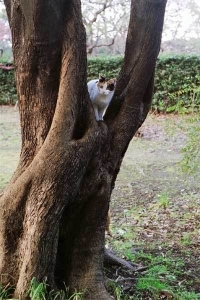 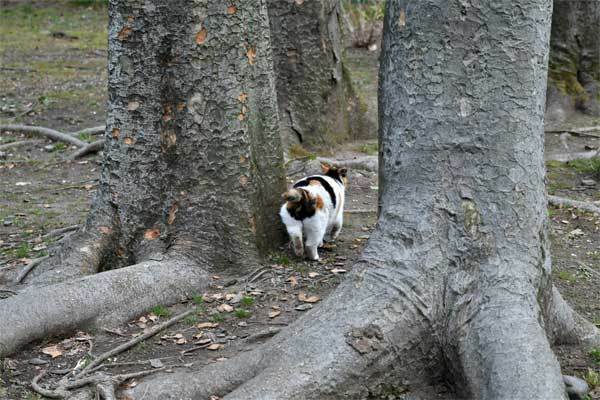 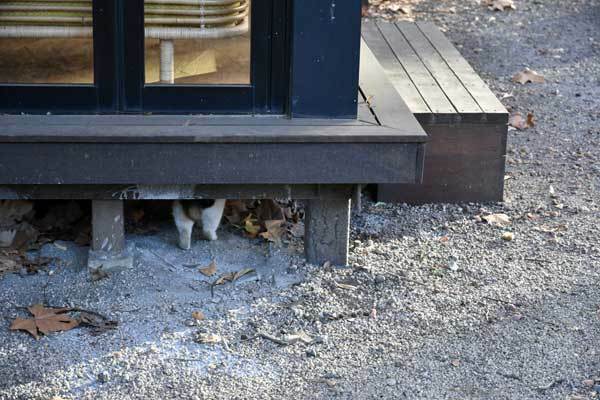 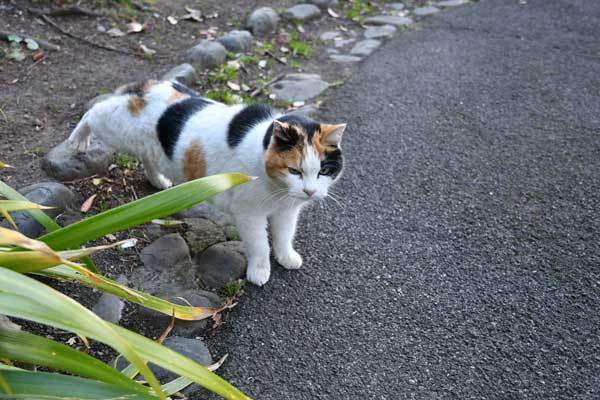 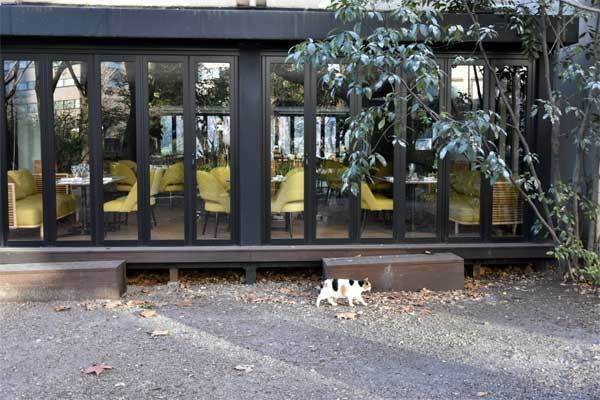 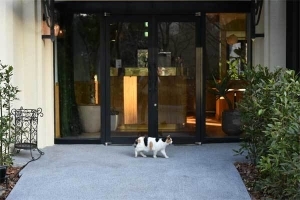 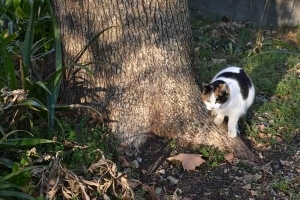 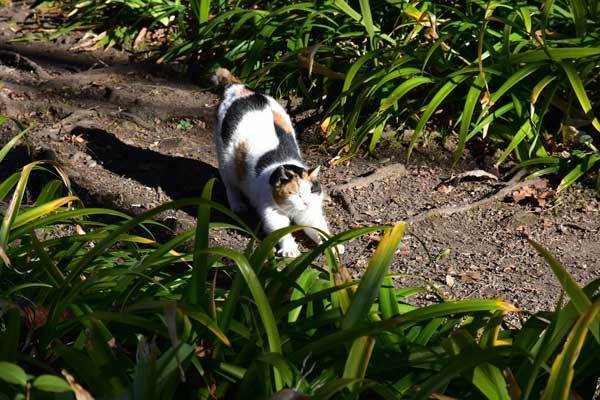 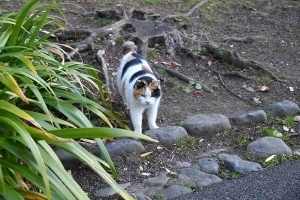 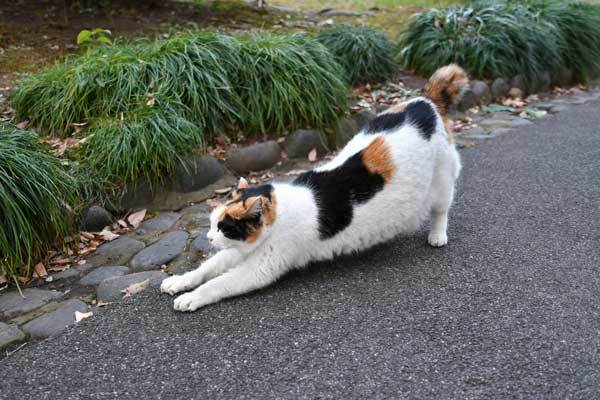 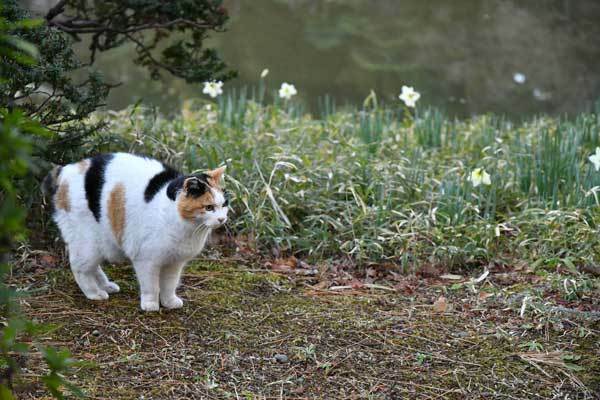 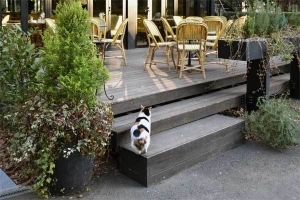 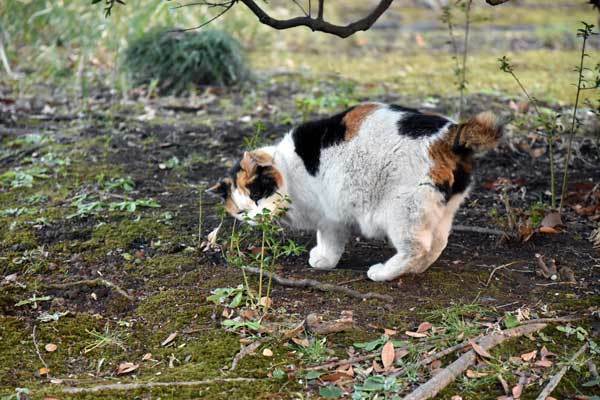 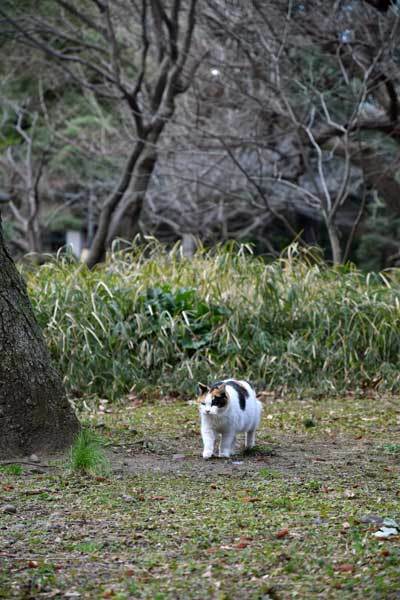 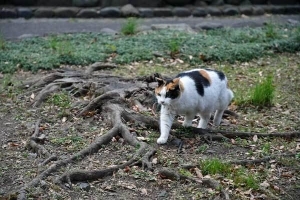 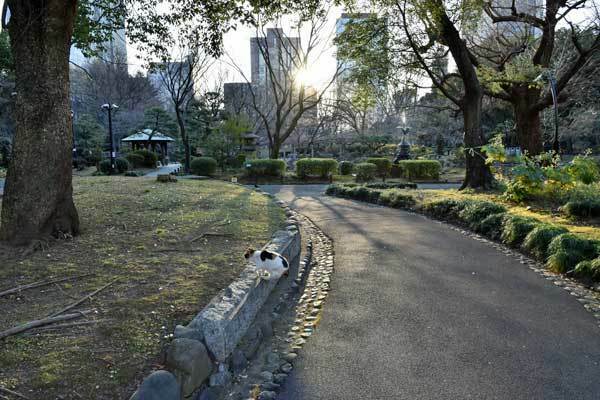 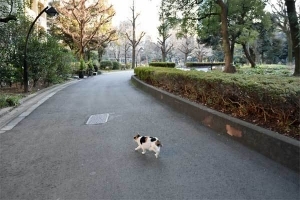 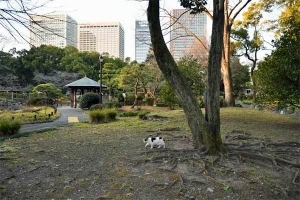 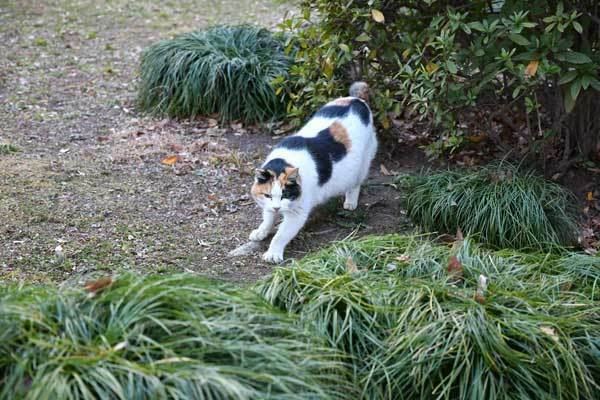 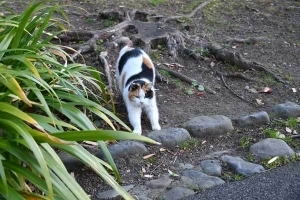 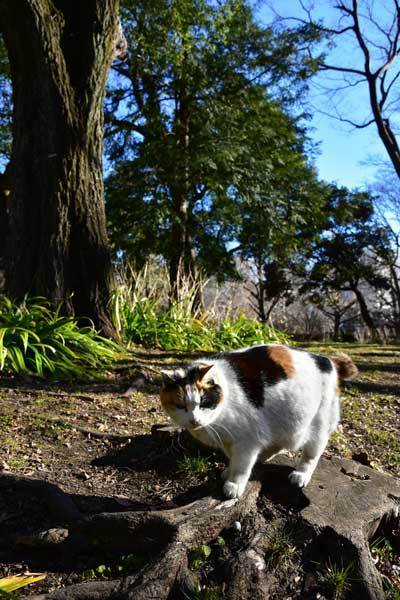 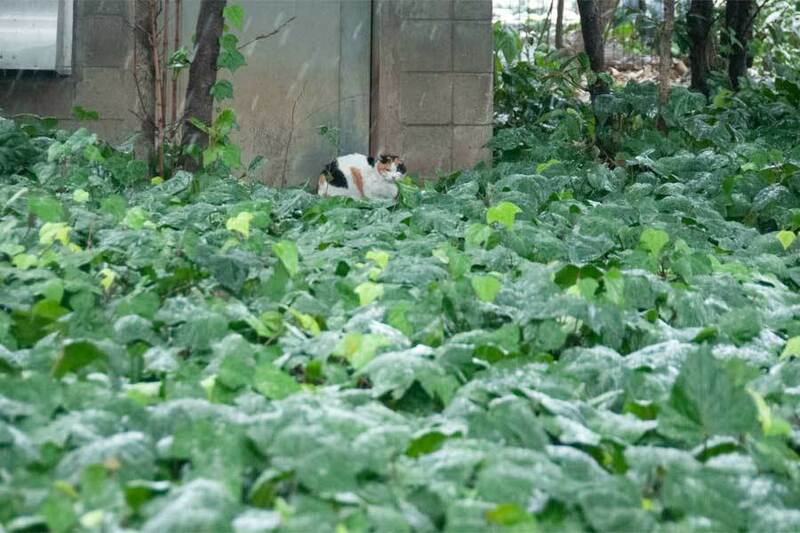 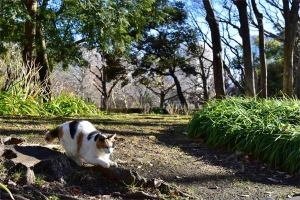 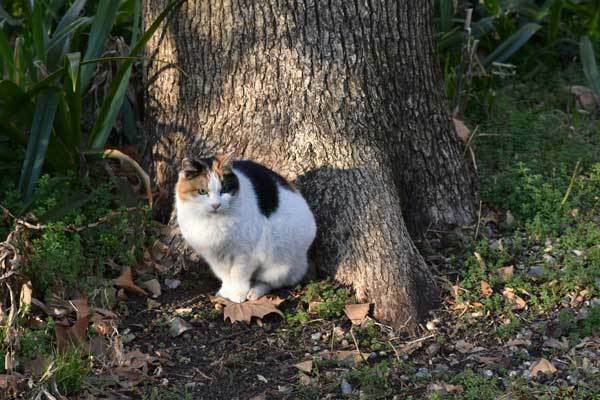 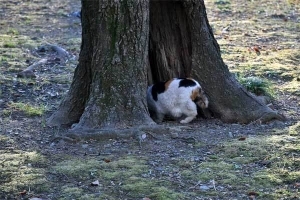 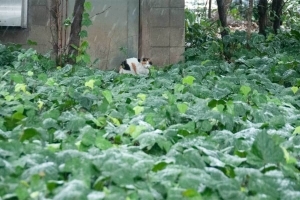 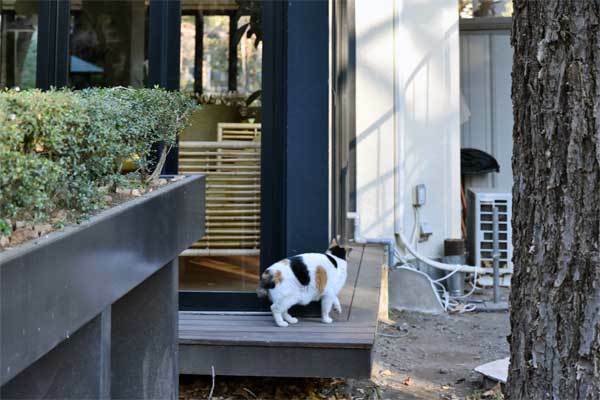 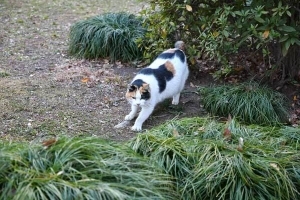 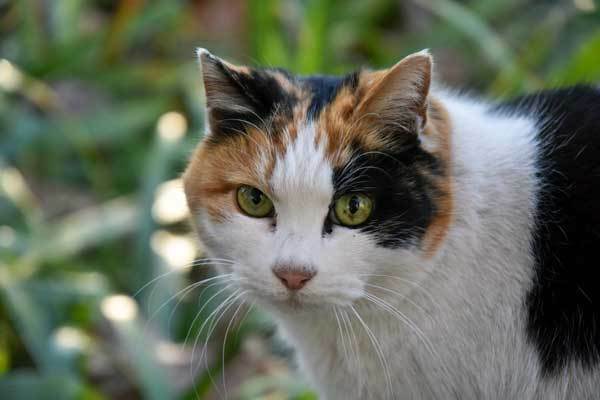 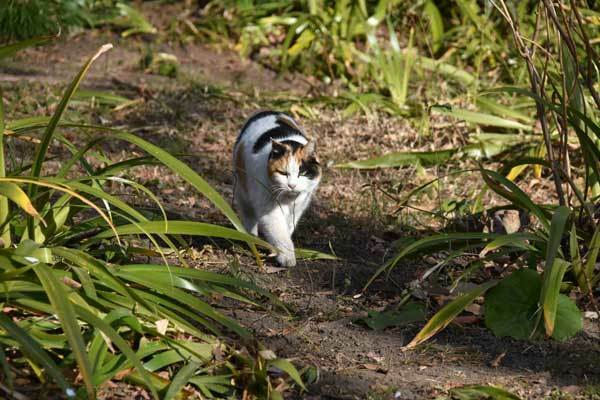 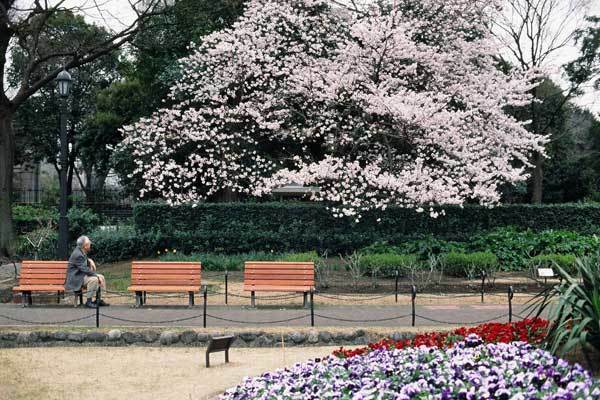 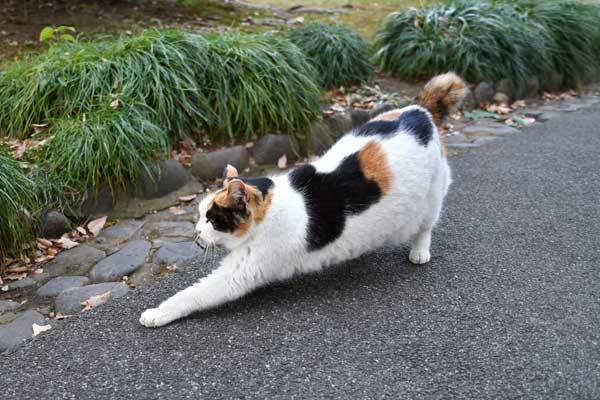 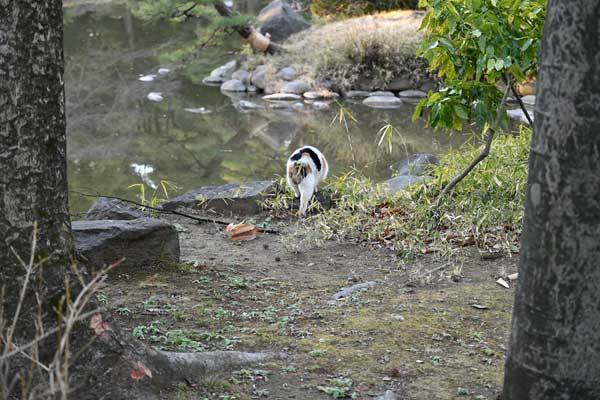 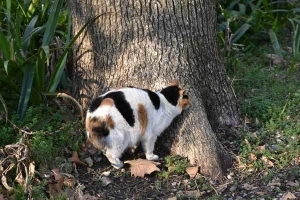 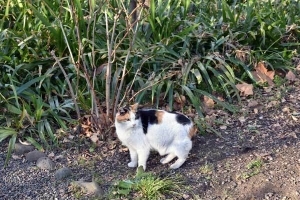 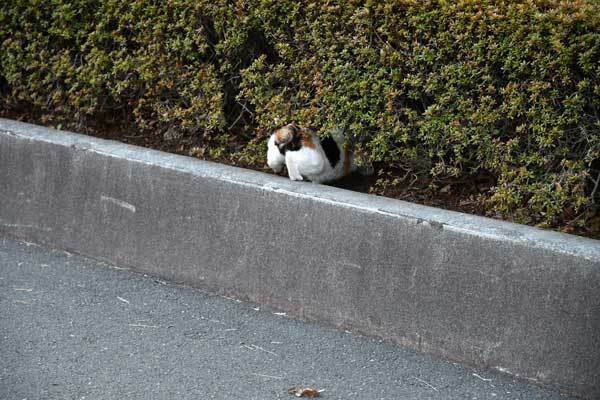 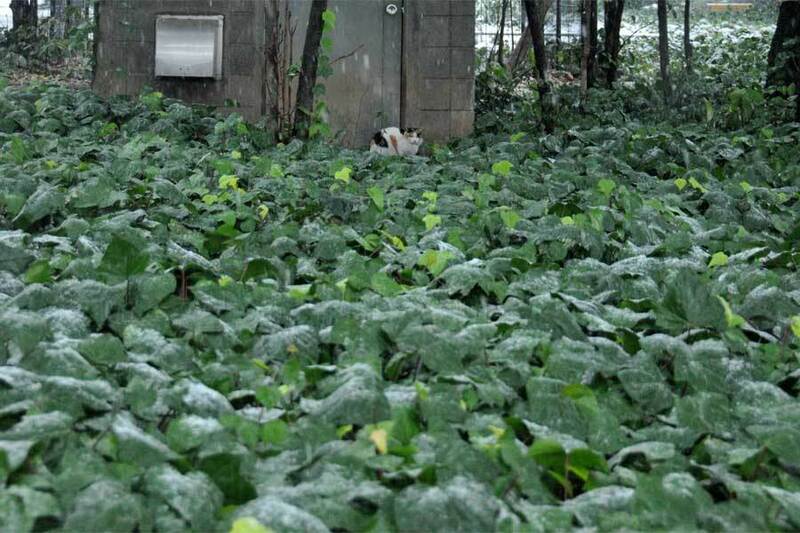 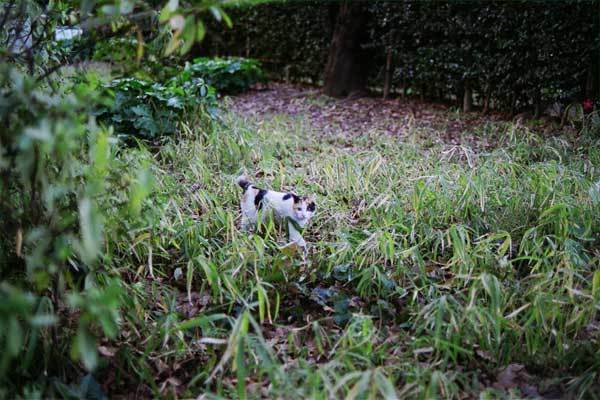 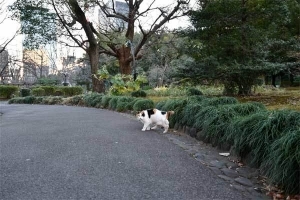 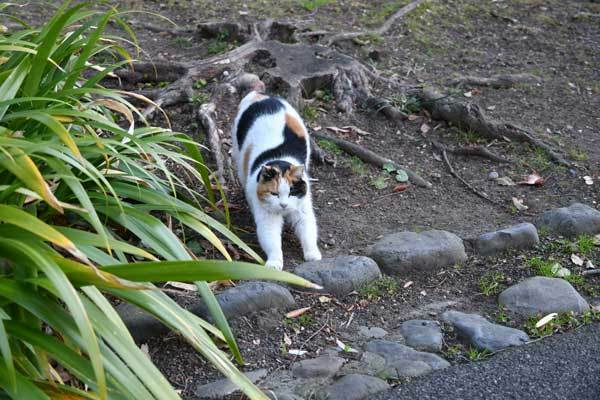 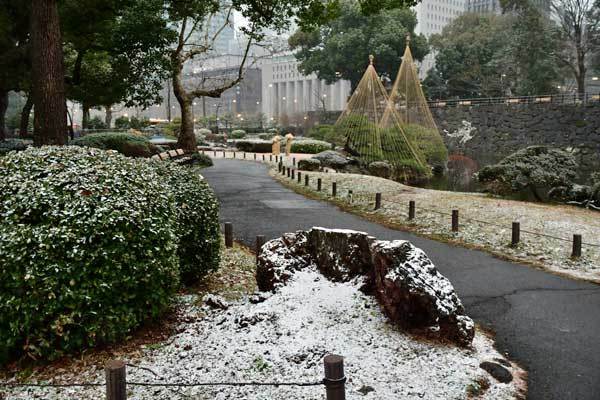 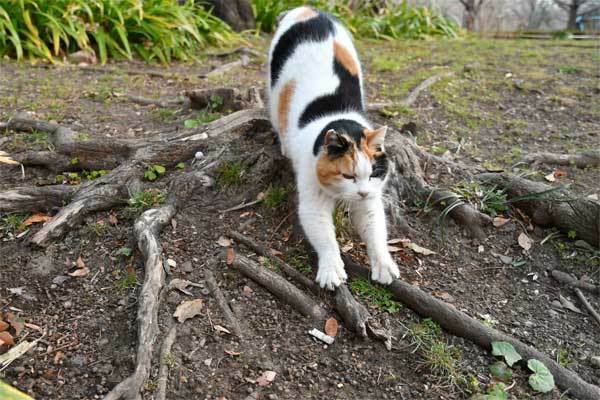 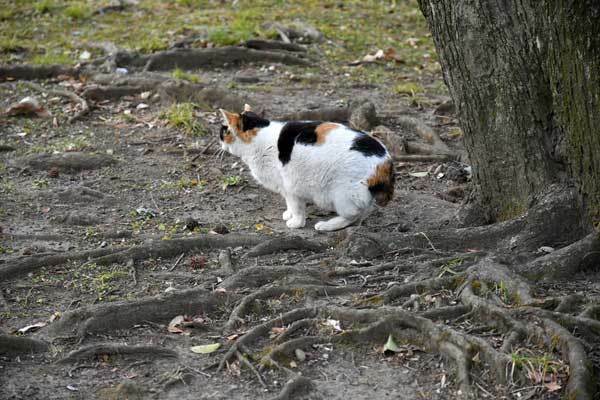 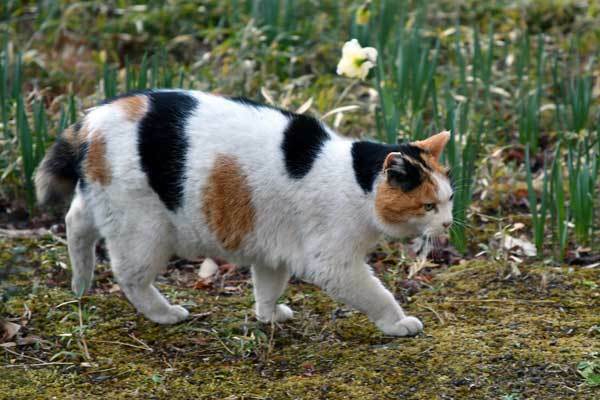 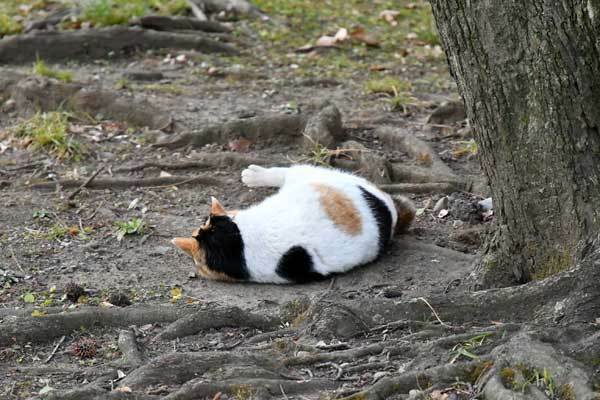 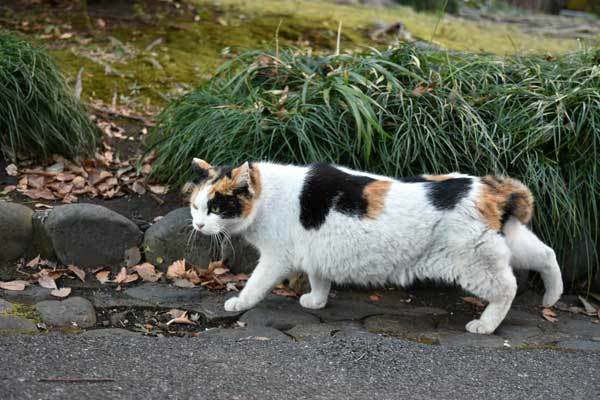 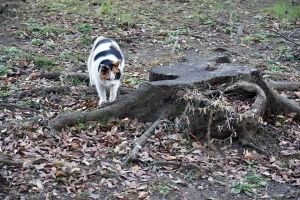 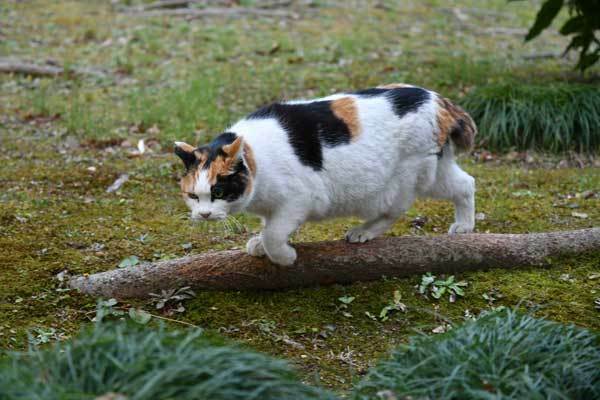 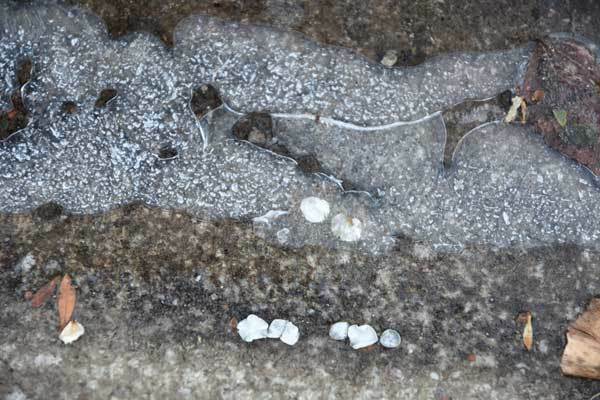 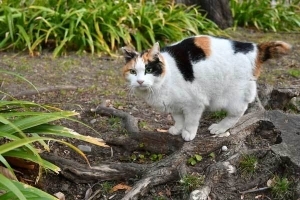 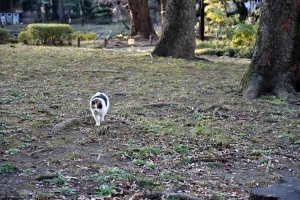 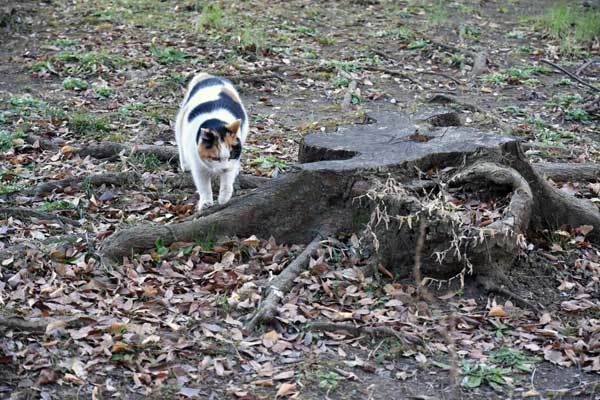 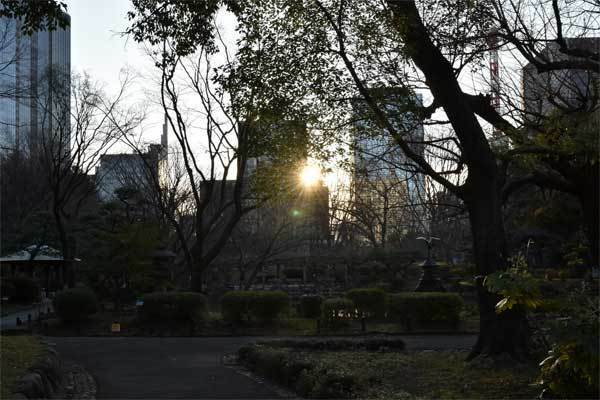 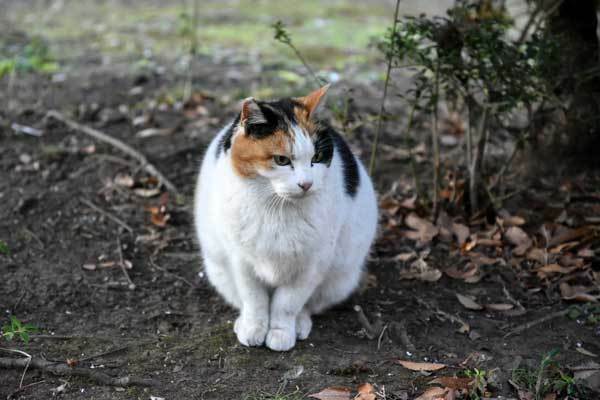 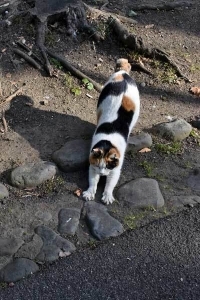 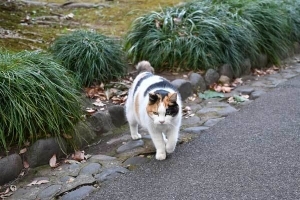 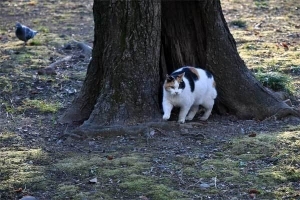 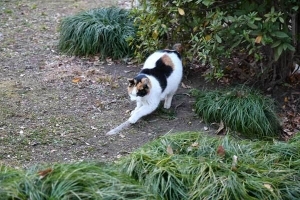 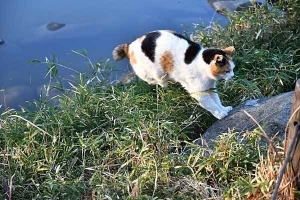 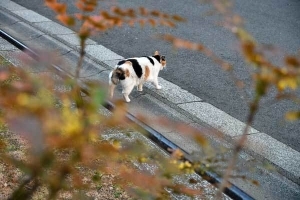 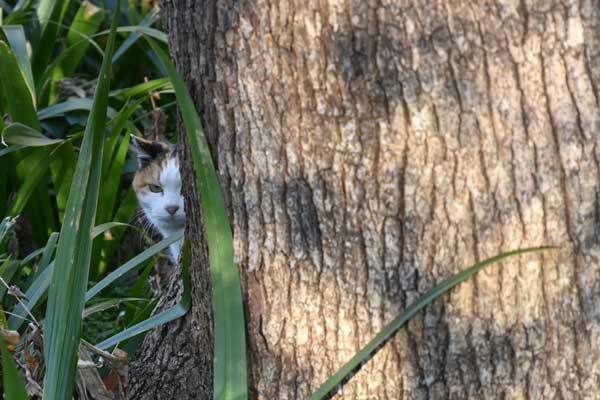 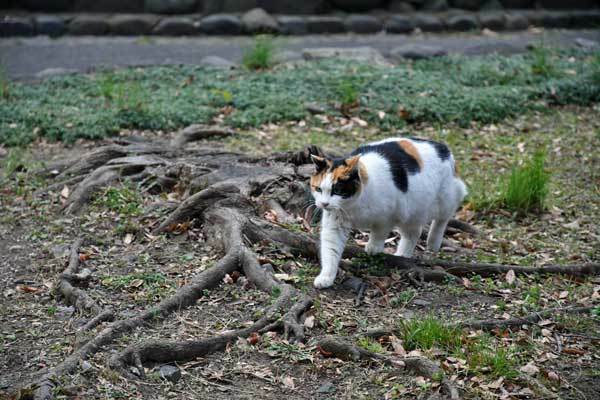 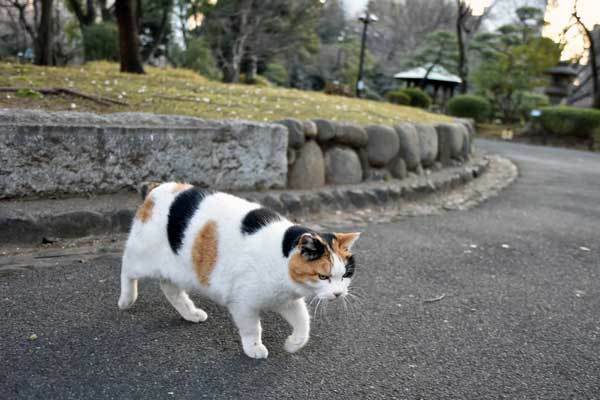 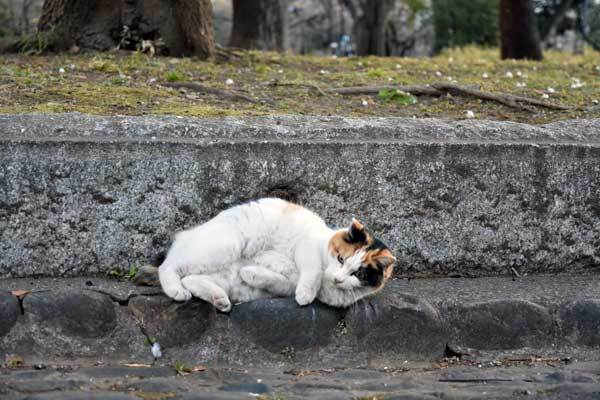 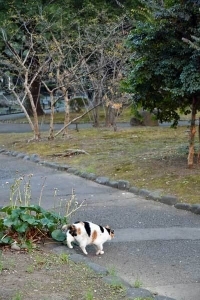 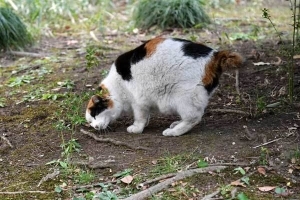 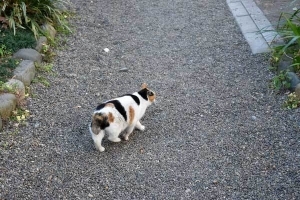 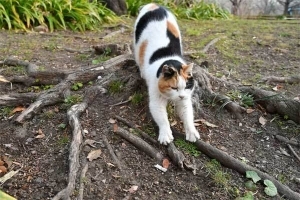 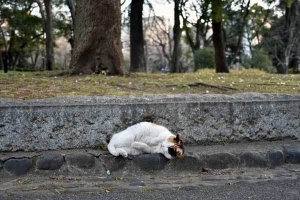 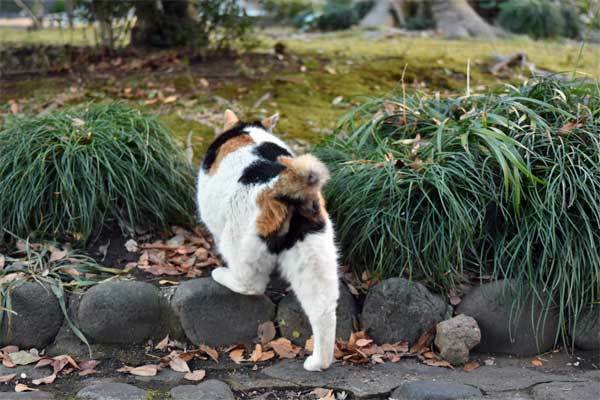 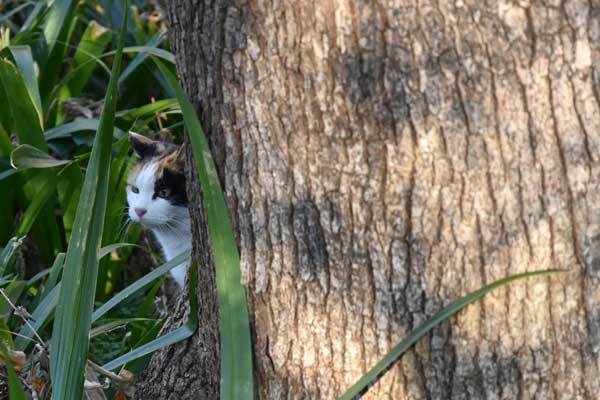 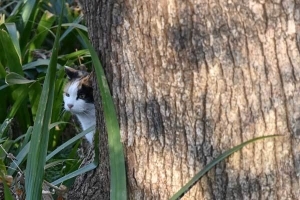 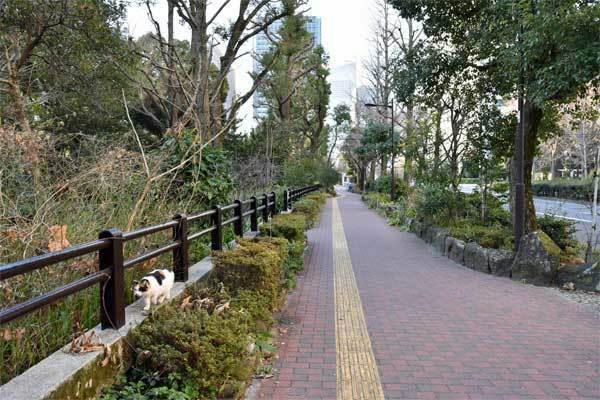 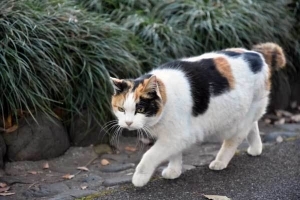 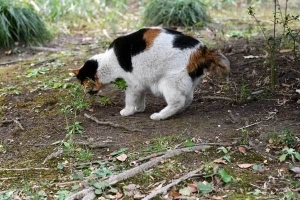 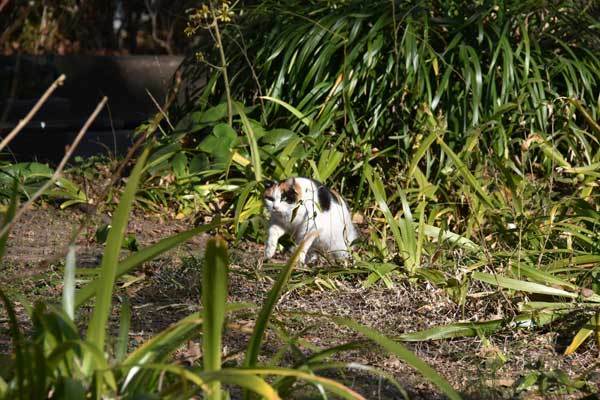 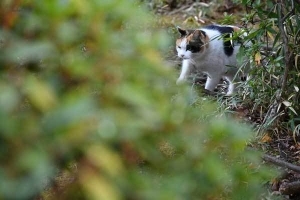 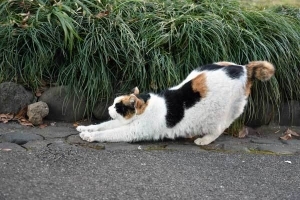 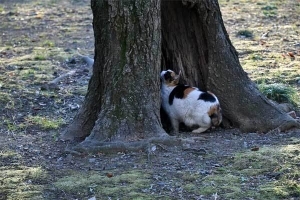 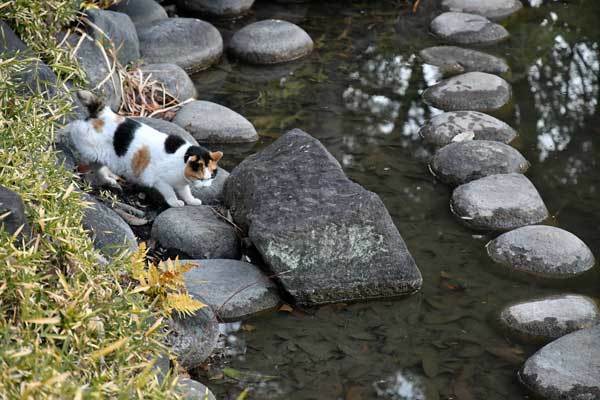 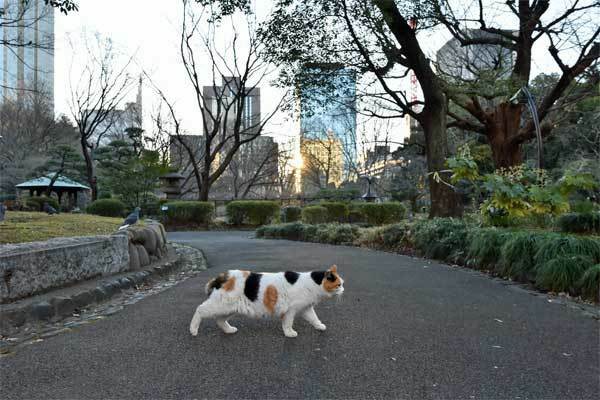 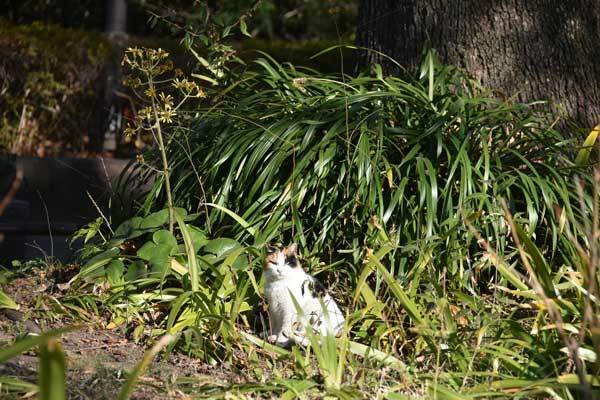 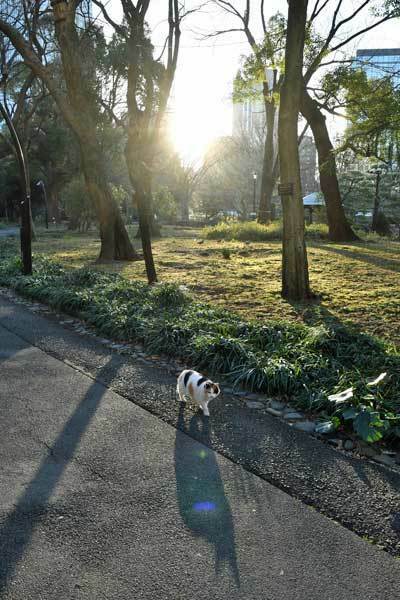 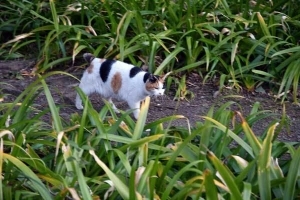 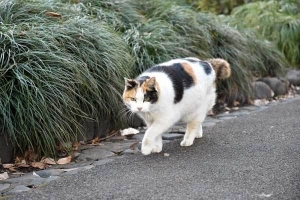 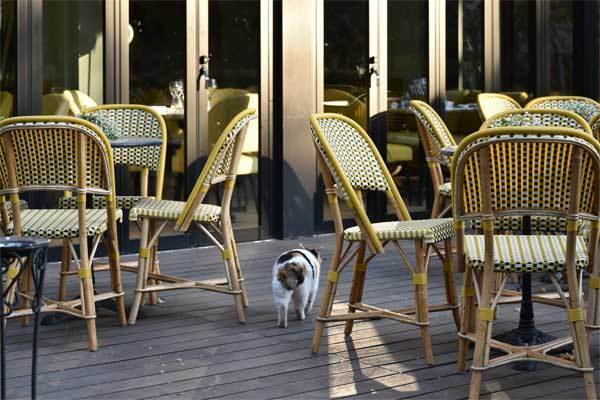 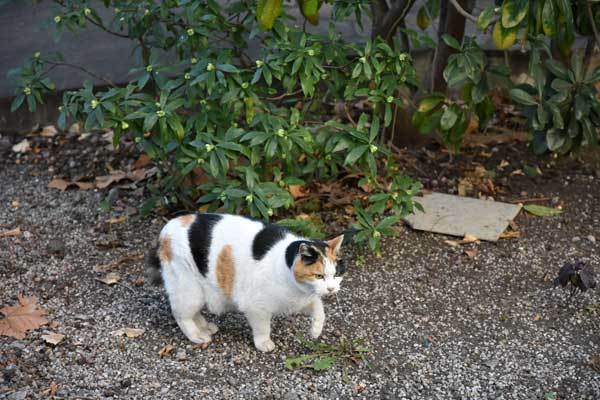 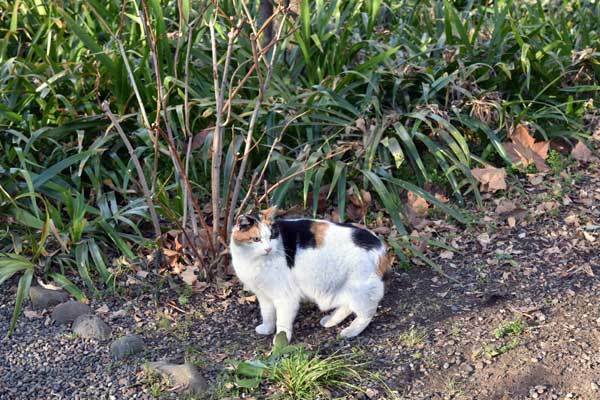 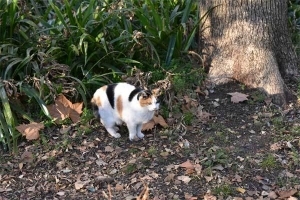 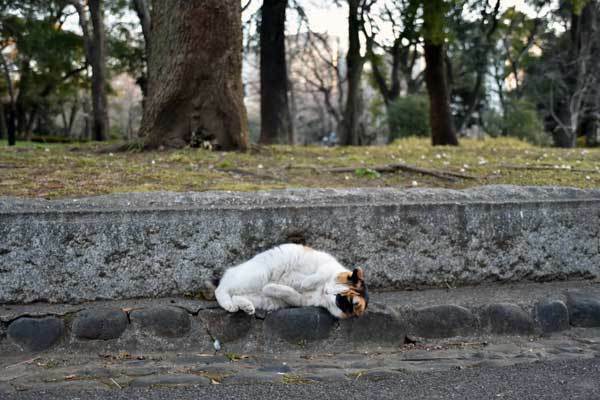 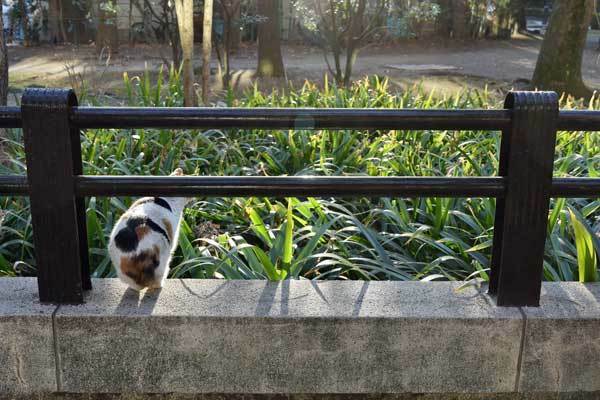 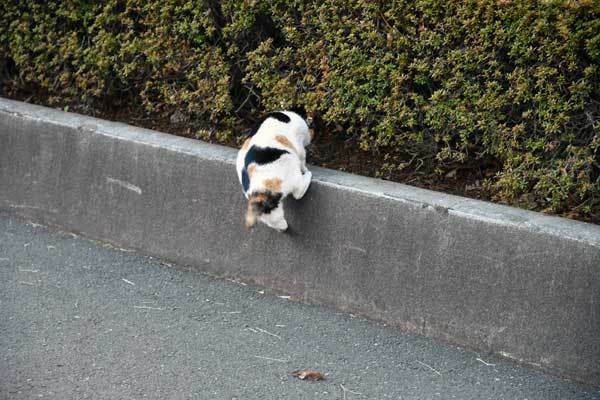 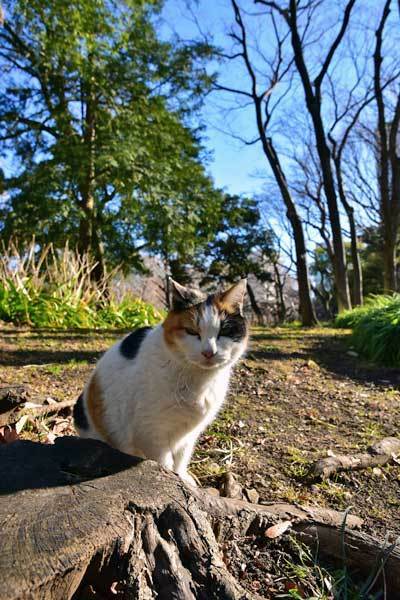 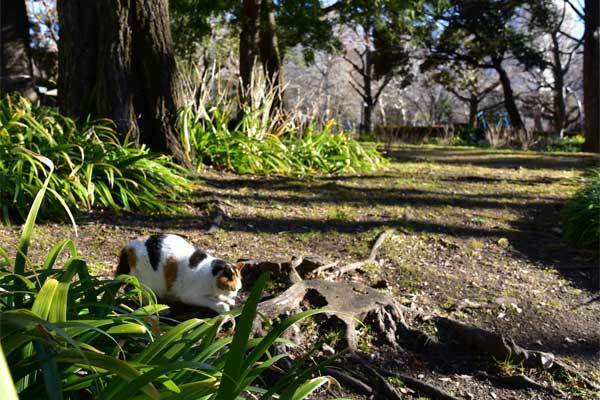 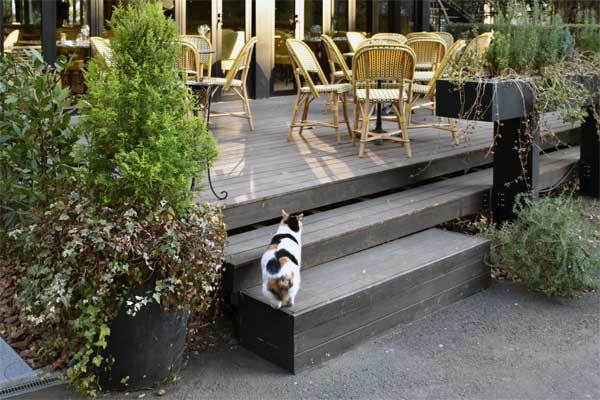 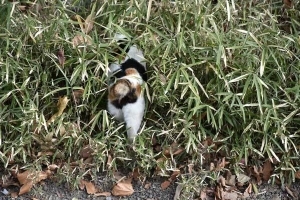 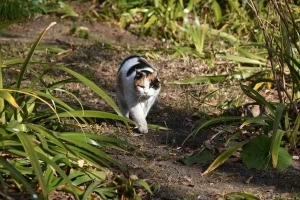 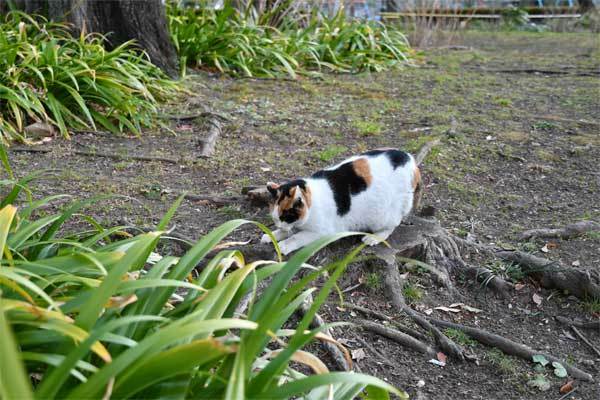 公園住いの人が餌遣りをしています。毎日来れない人に頼まれてやっているそうです。A park "resident" is feeding cats; he says he has been doing so at the request of caregivers who cannot come everyday. 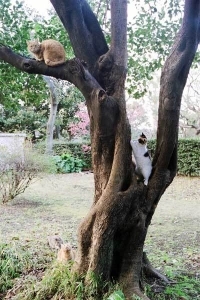 さくらちゃんは左から三番目 Sakura-chan is the third from left. 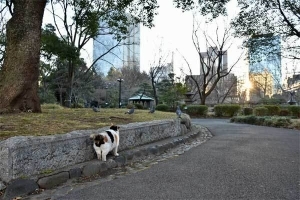 柵アーチの底辺は50センチです。The span of the arch is 50 cm. 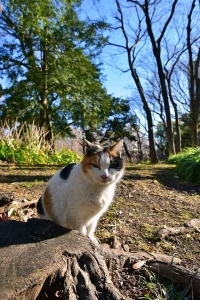 2001年生まれだと思いますが、何月頃かな I think she was born in 2001, and wonder it was which month? 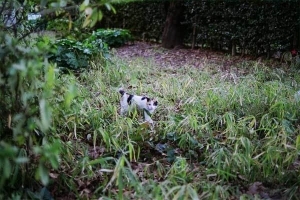 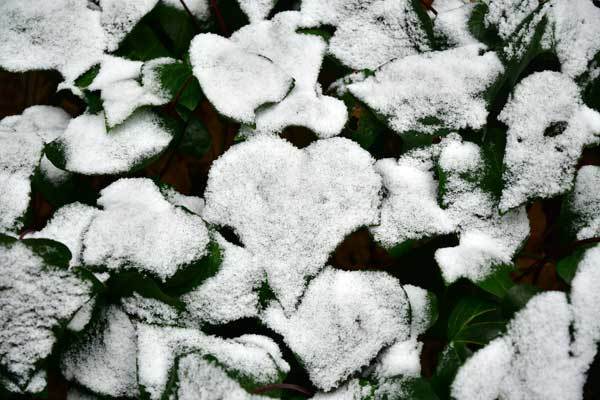 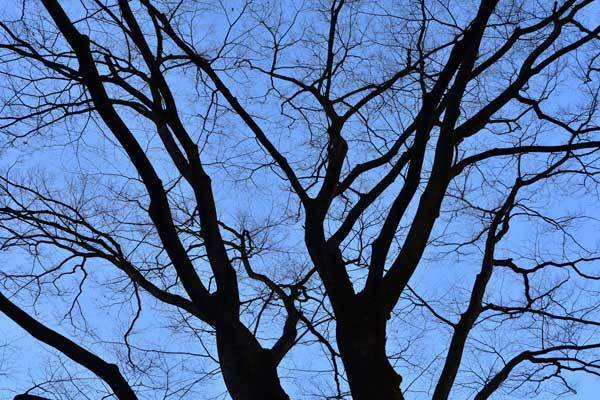 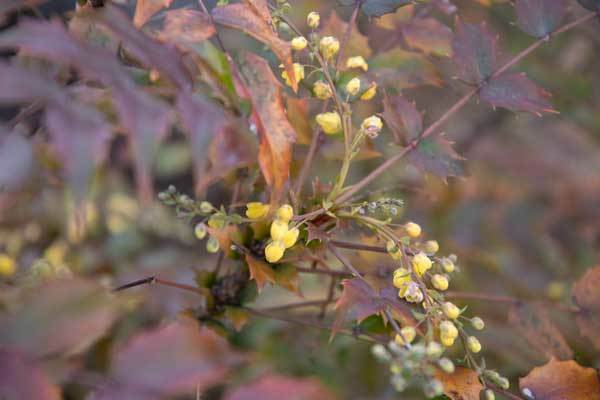 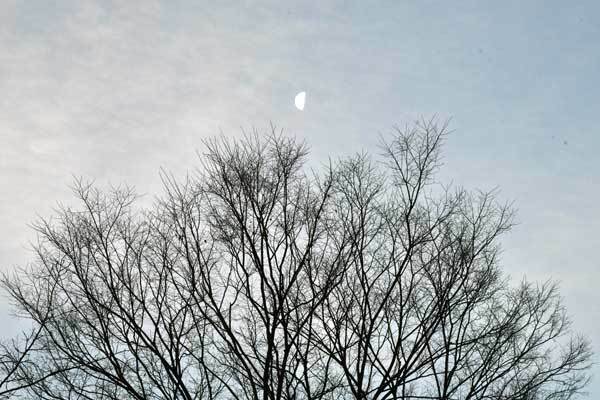 最初の5枚の写真は垣根の向こう側で撮りました。The first four pictures were taken on the other side of green hedge. 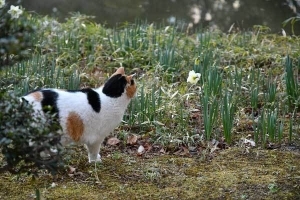 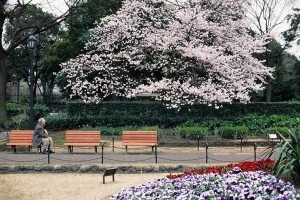 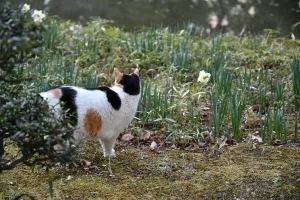 さくらちゃんもこの桜を見ているはずです。She must have seen this sakura, too. 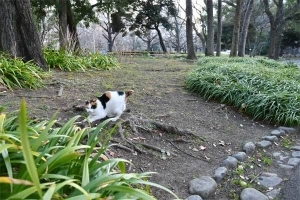 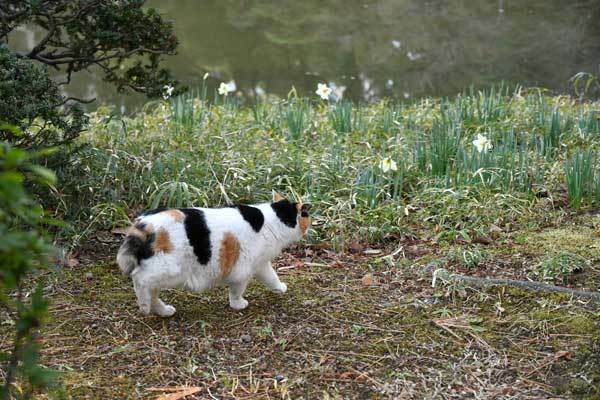 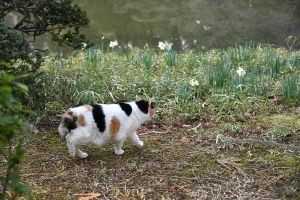 だいぶ散りましたが、さくらちゃんの最初の桜猫写真です。The blossoms are almost gone, though, this is the first Sakura Cat picture by Sakura-chan. 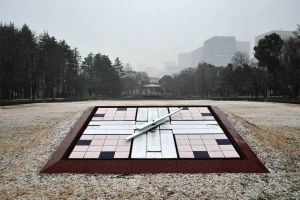 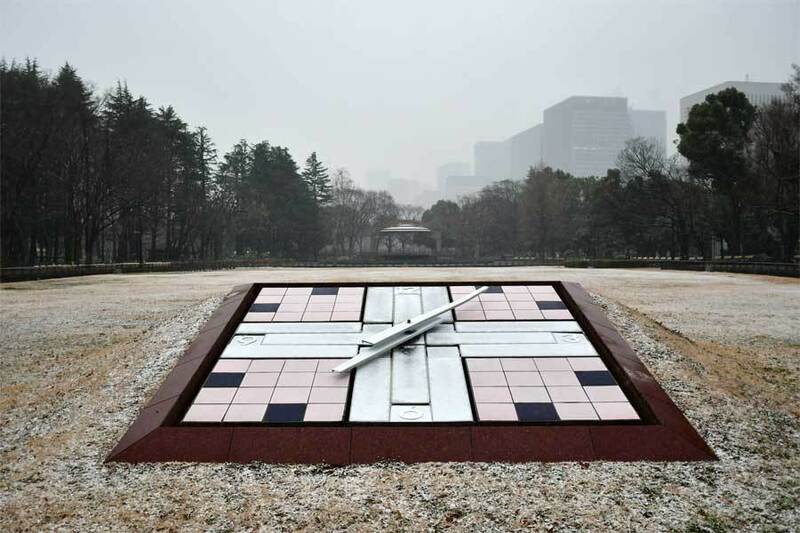 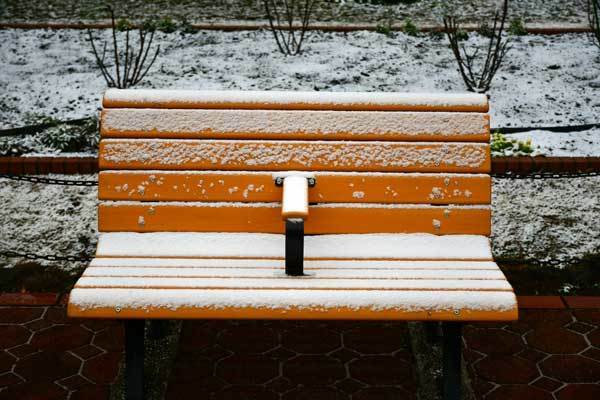 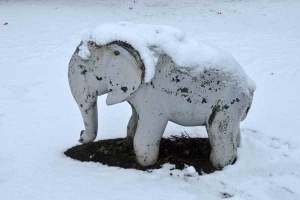 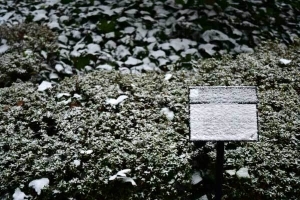 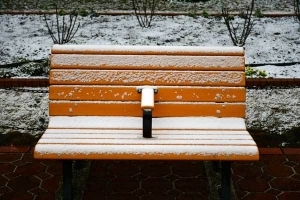 レンガの長辺は21cm、ギャップが1cmほどです。A brick is 20 cm long, the gap is about 1cm. 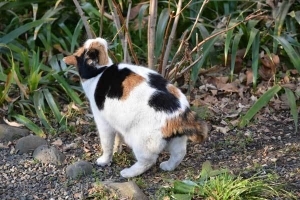 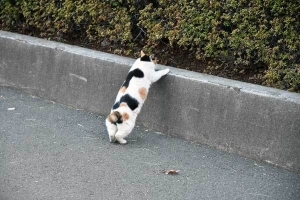 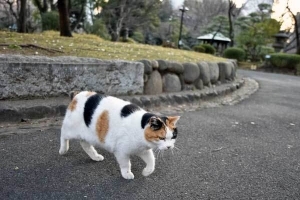 比較のために、大きくなったさくらちゃんのサイズを量る必要がありますね。I think I need to measure the size of grown-up Sakura-chan for comparison. 今年 (2017年) 16歳になりますが、ずっと若く見えます。She will be 16 this year (2017), but looks much younger. もう一度おはよー Good Morning Once Again! 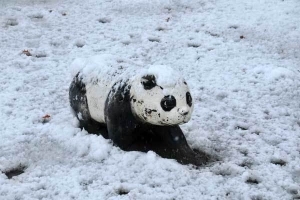 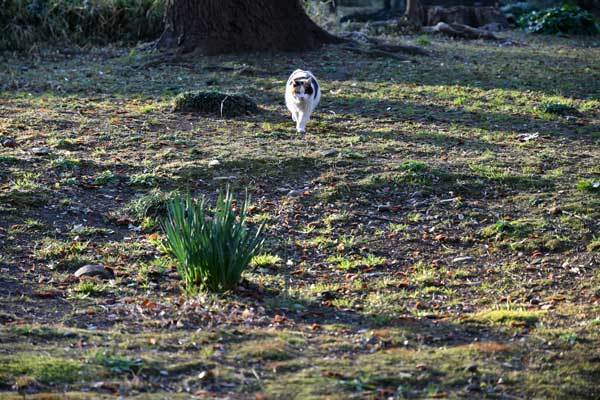 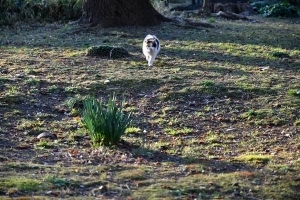 Pong has not been seen by anybody since early January. 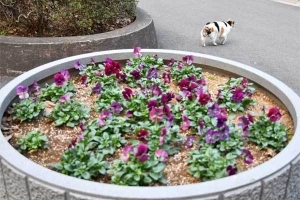 Sensing something unusual, I thought, Sakura-chan came to see how Pong was. 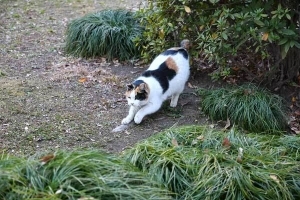 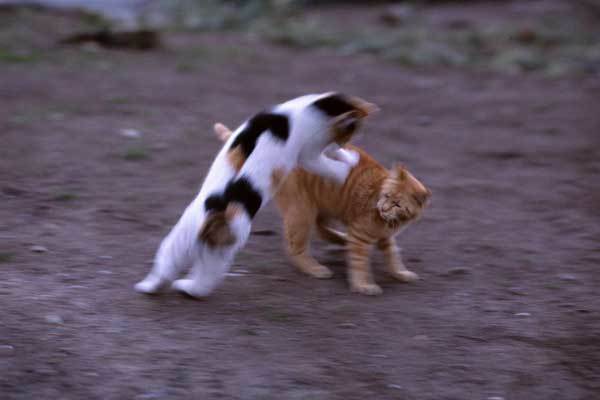 I'm so nervous because I'm in the territory of the other cat (Pong). 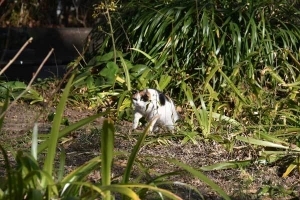 Pong はどこにいるのだろう I wonder where is Pong now? 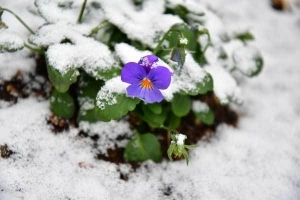 明後日に続きます。To be continued the day after tomorrow. 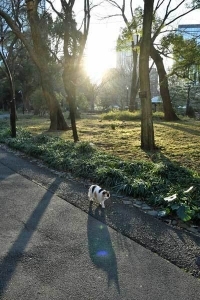 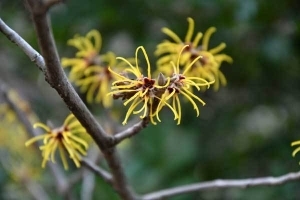 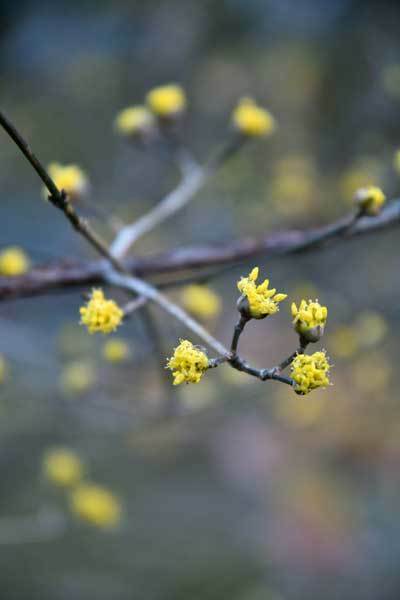 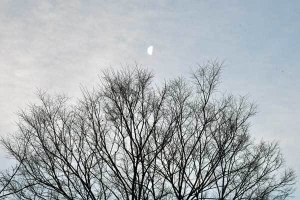 明日は「春節を祝おう」です。Tomorrow "Let's celebrate Spring Festival".